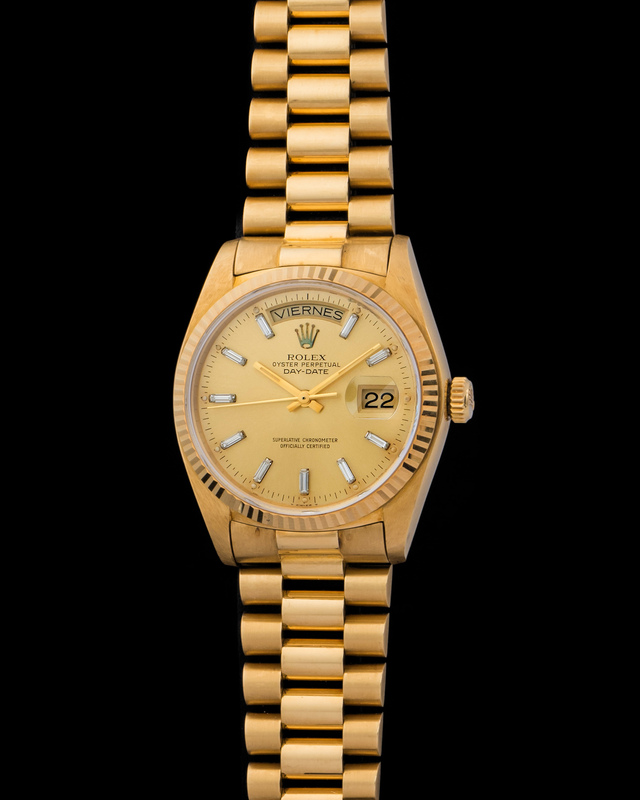 The elegance of a Rolex Day-Date was evident from the first reference released to the current available to the market. 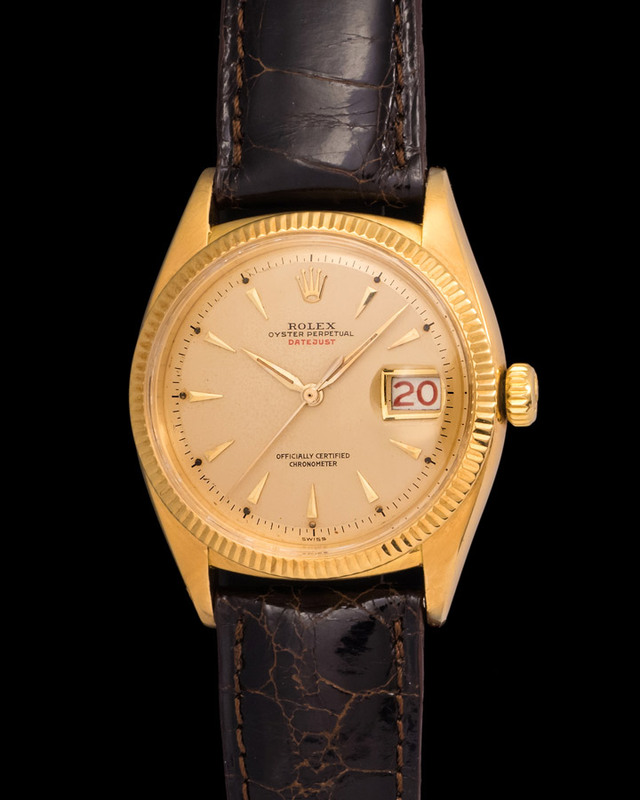 These are watches that have graced the wrists of some of the most important men in the world's history. 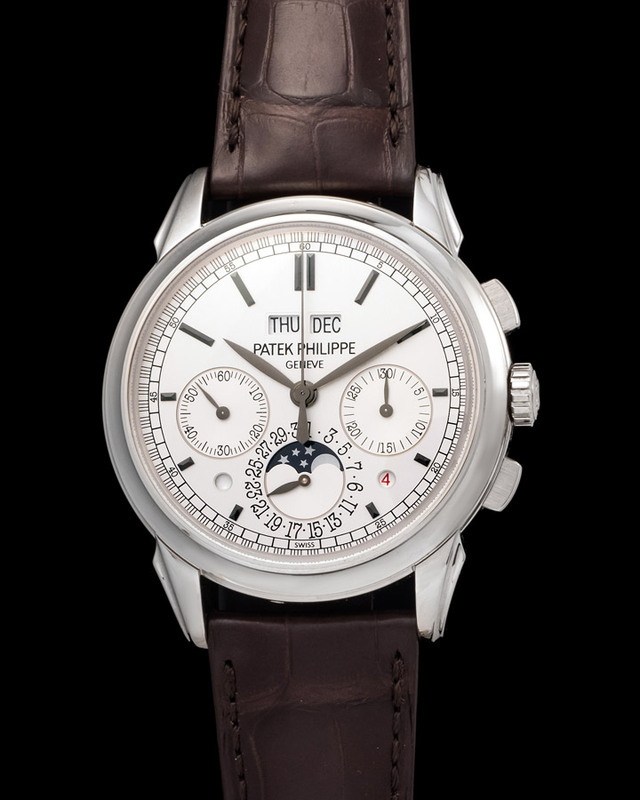 Here we have a reference 1803 cased in white gold and put together by a leather strap. 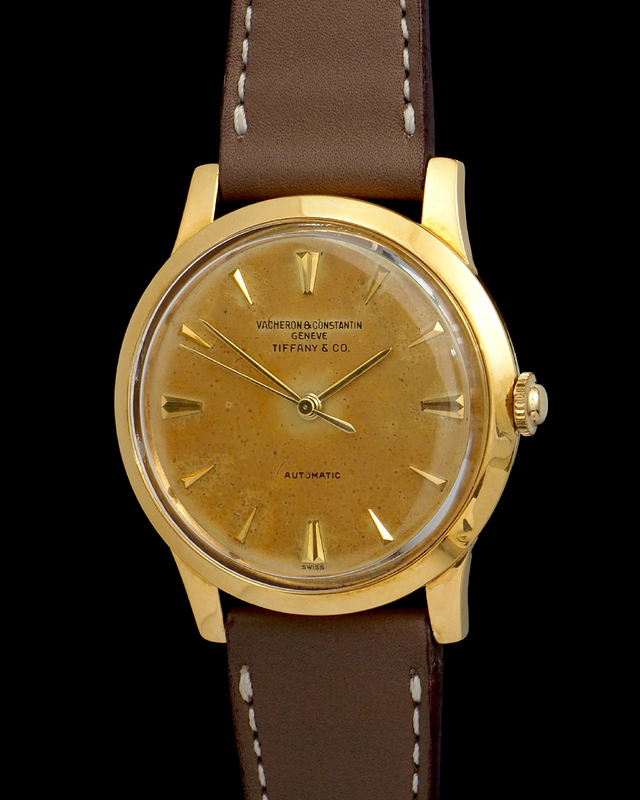 The watch was manufactured in 1972 and is fitted with an ever cool "linen" dial. 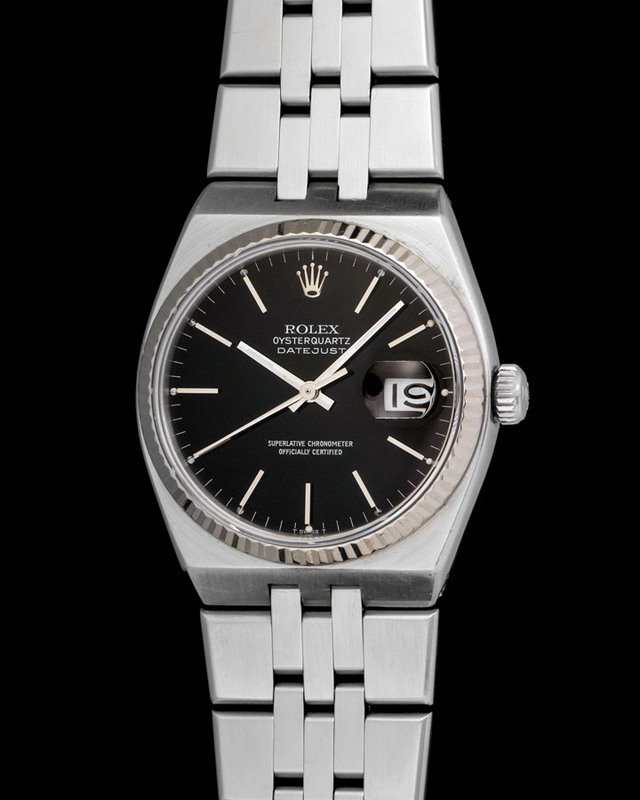 The elegance of a Rolex Day-Date was evident from the first reference released to the current available to the market. These are watches that have graced the wrists of some of the most important men in the world's history. 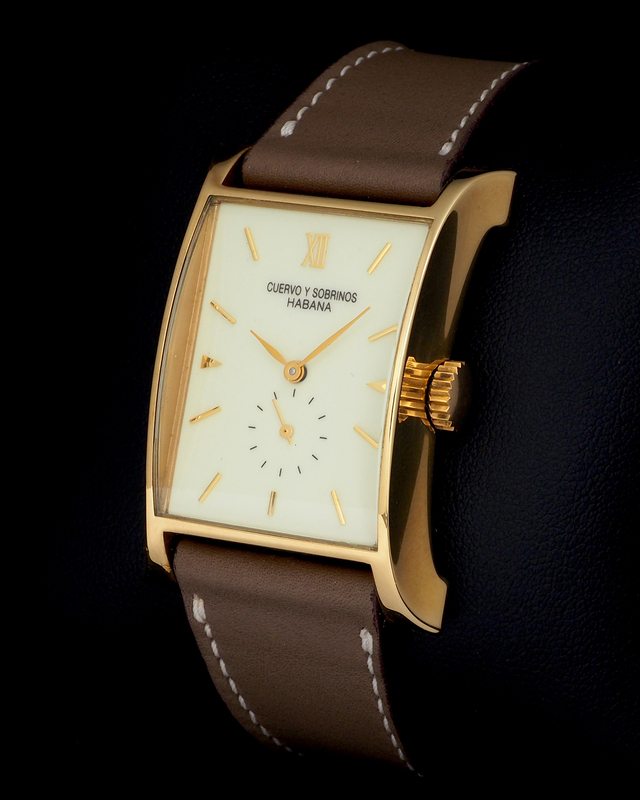 Here we have a reference 1803 fitted with a gold dial cased in yellow gold and put together by an elegant brown strap. 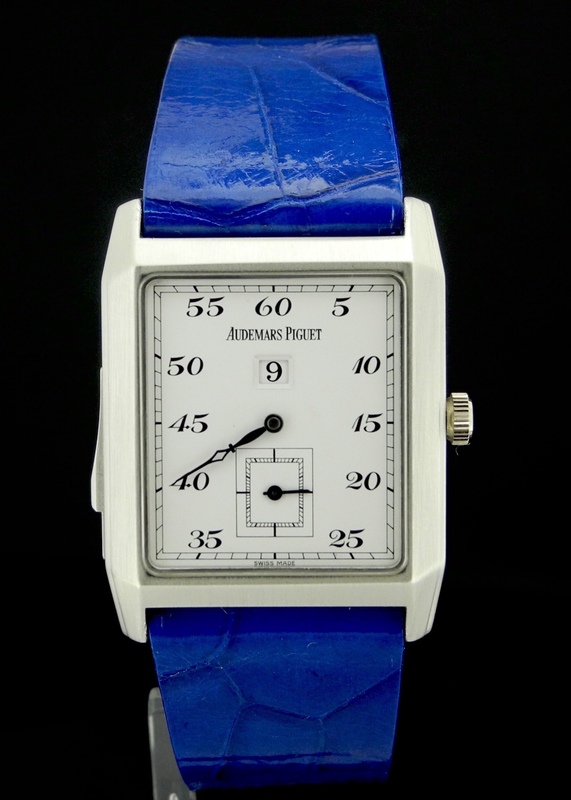 Distinctive Audemars Piguet cased in a white gold square 37mm case and powered by an automatic movement. 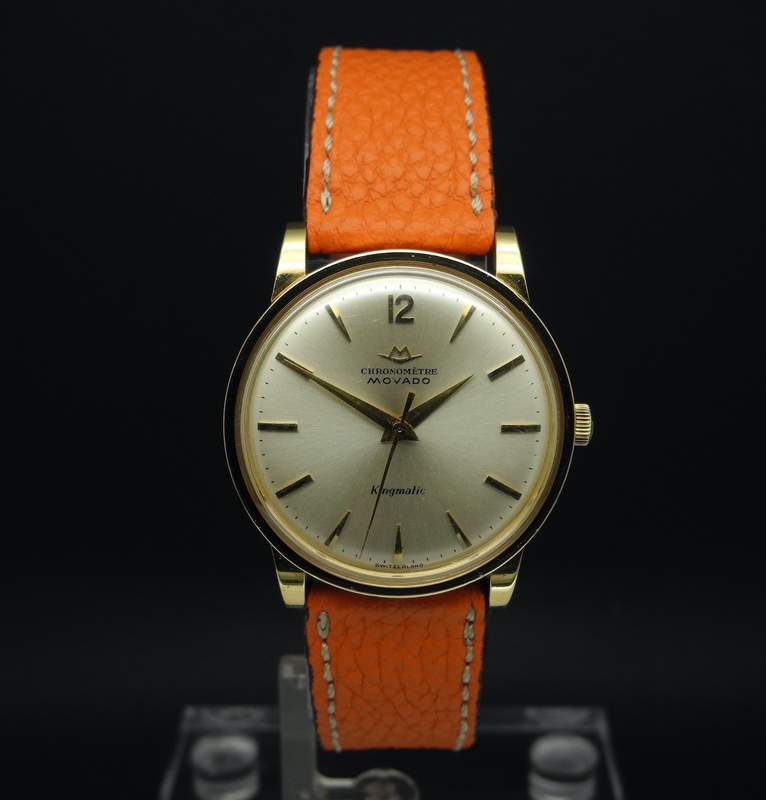 This watch is beautiful and has that particular 70's style. Put together by a brown leather strap. 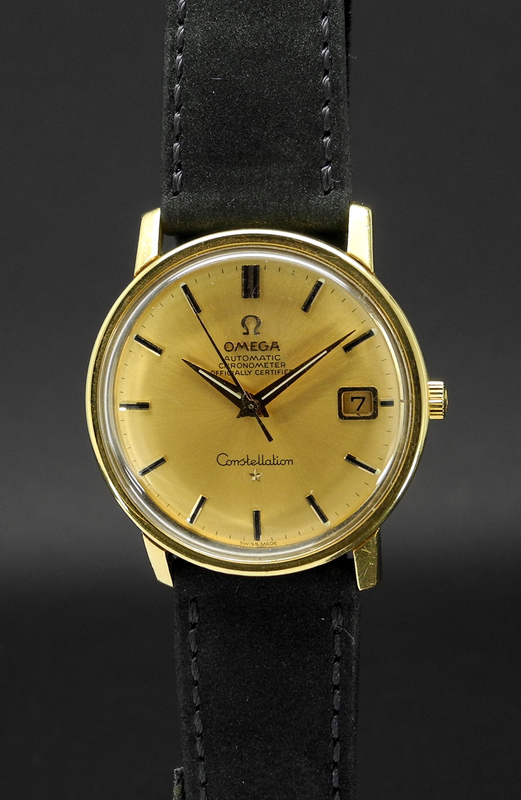 Omega Constellation cased in 18k yellow gold and powered by an automatic movement. 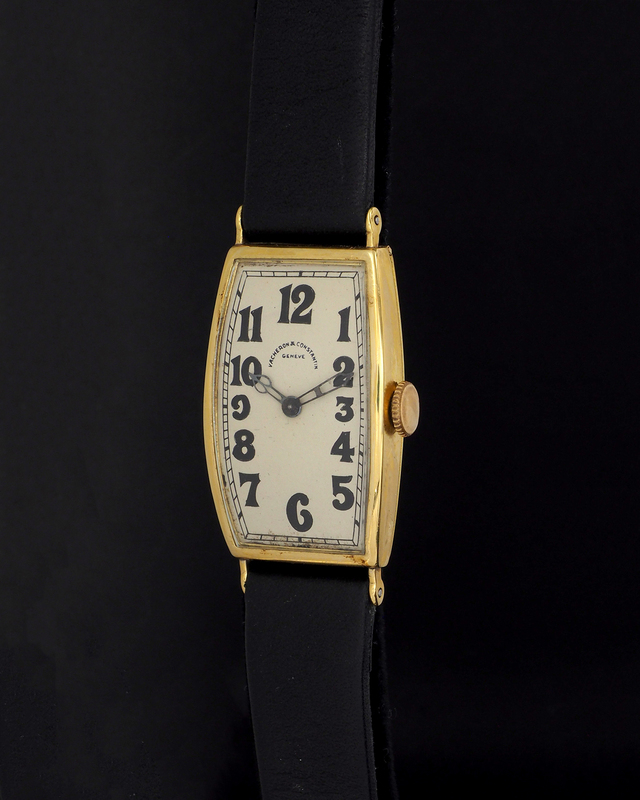 The striking detail of this watch is the fact that it is in like new condition and is fitted with a mesmerizing gold dial. 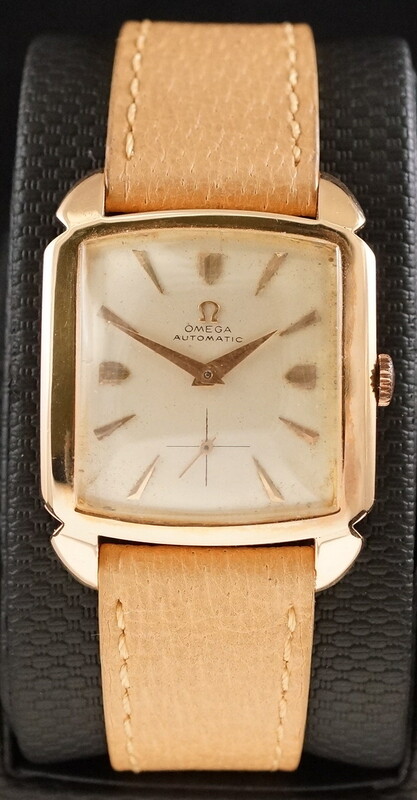 The Omega is put together by a leather strap. 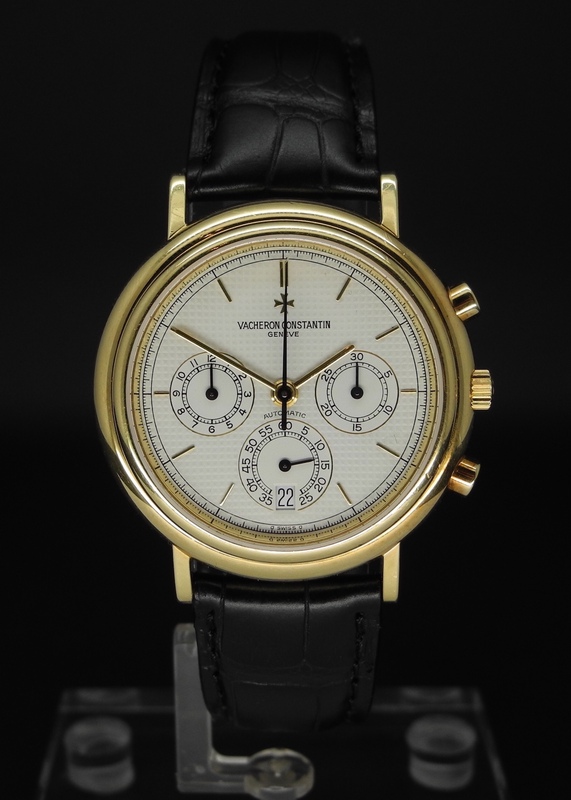 Beautiful and elegant Vacheron & Constantin chronograph cased in yellow gold and powered by an automatic movement. This watch is in top condition and is put together by a black leather strap accompanied by a Vacheron buckle. The look and feel of this vintage Memovox is fantastic. 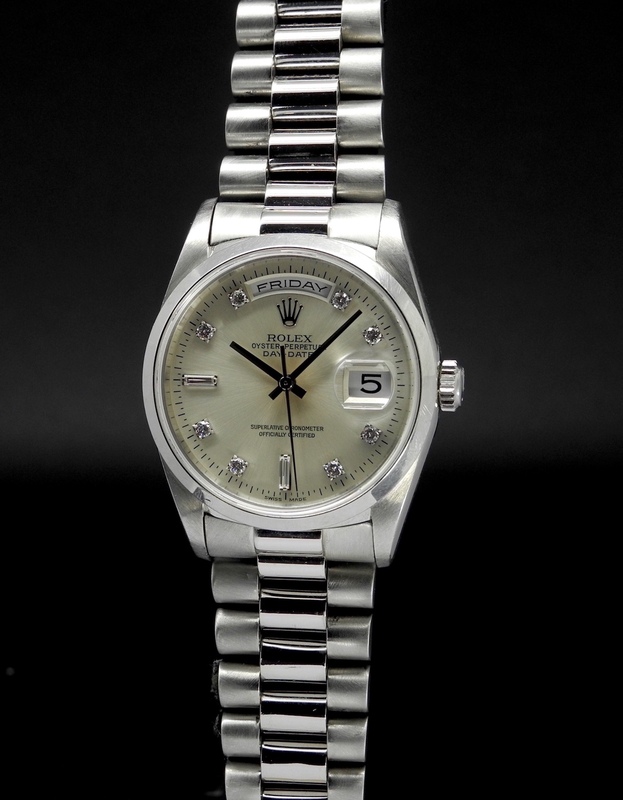 How cool are the dual crowns and the clean silver dial. 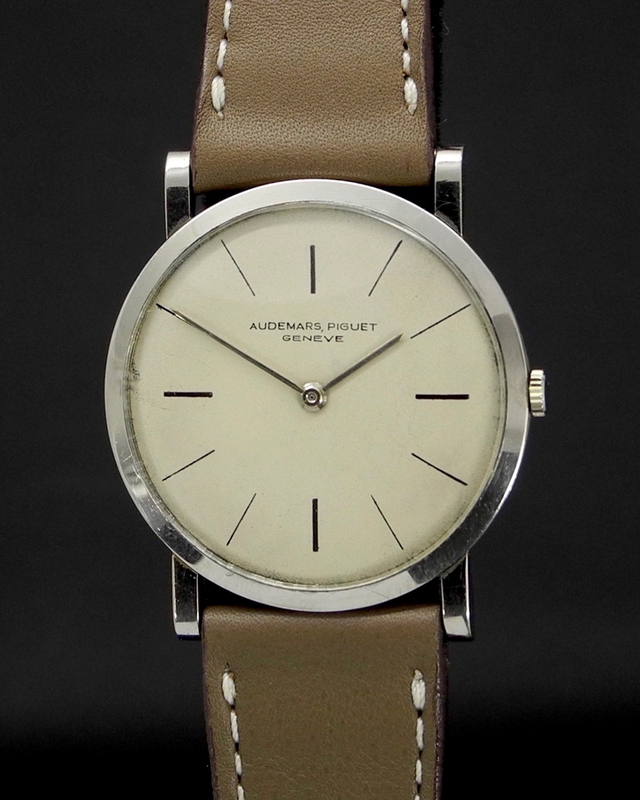 This watch is powered by an automatic movement and is put together by a brown leather strap. 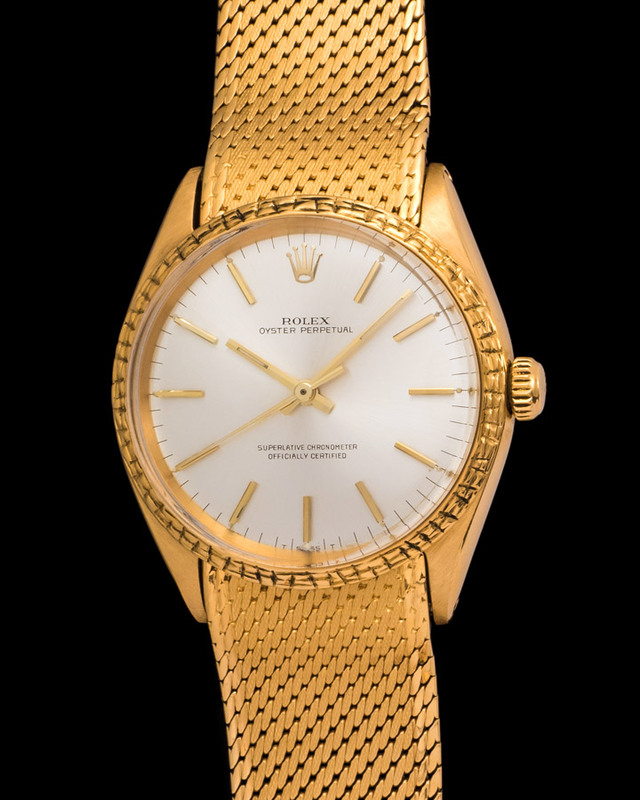 Rolex Square reference 9878 cased in 18K yellow gold and powered by a manual caliber. 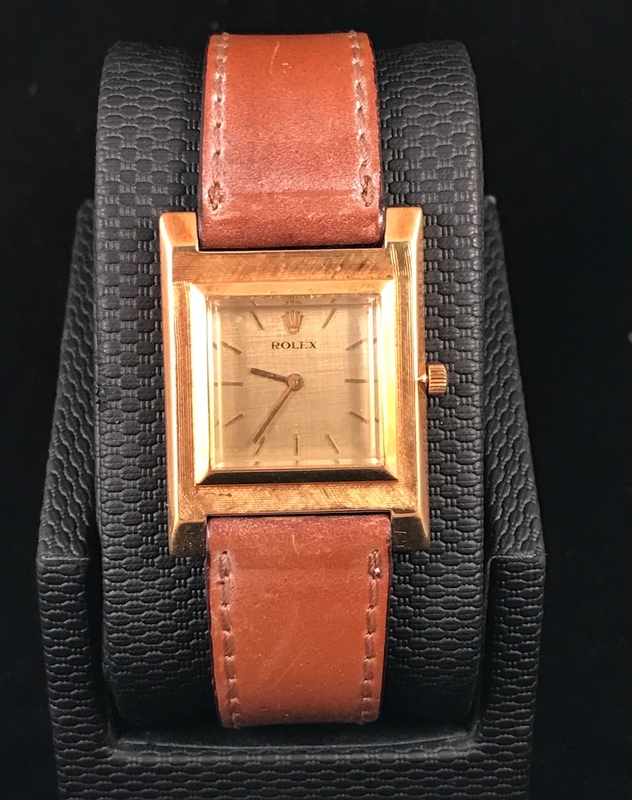 This watch aside from the fact that it is incredibly comfortable to wear it is also a pleasure to look at, finished in an outstanding "florentine" texture. This watch is in top condition, working in perfect order. 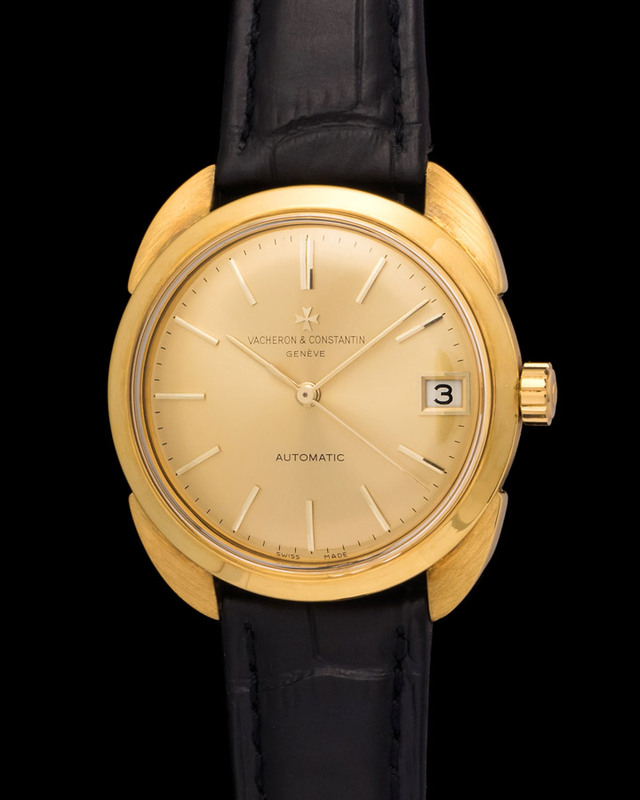 The reference 3450 was first introduced to the market in 1981 with a slight upgrade in the movement from its beloved predecessor, reference 3448. Ultimately, both references were discontinued in 1985 after the launch of the reference 3940. 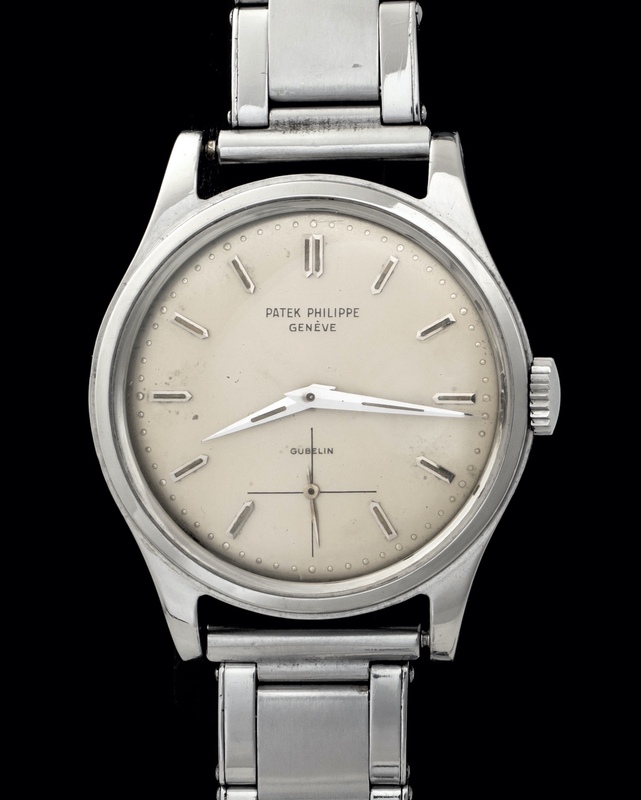 The basis for the calibre 27-460 QB movement is Patek Philippe’s 27-460 automatic movement first introduced in 1962. The upgrade in the movement, Quantième Bissextile, includes the leap year function. Scholarship tells us that there were 244 examples made, the majority in yellow gold. 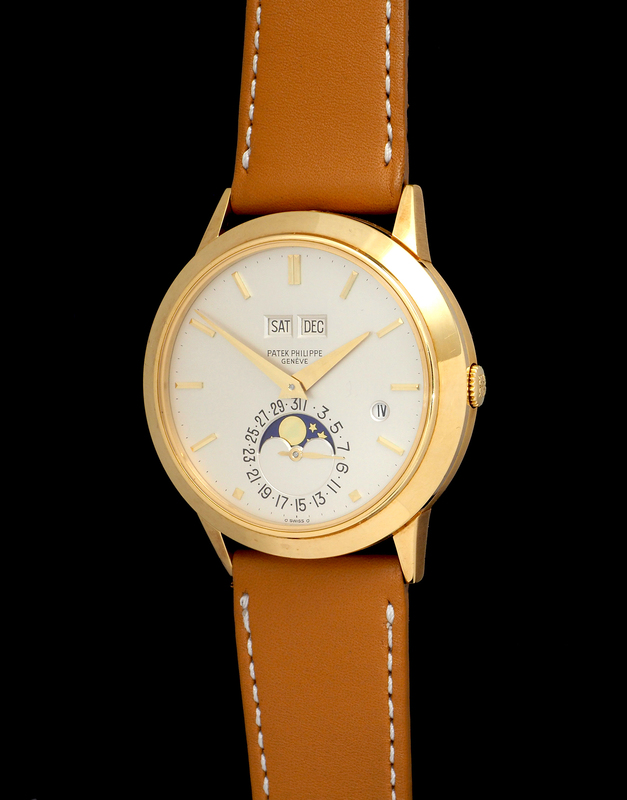 Elegant Movado cased in 18K yellow gold and put together by a beautiful leather strap. Powered by an automatic movement and cased in a 33mm case. 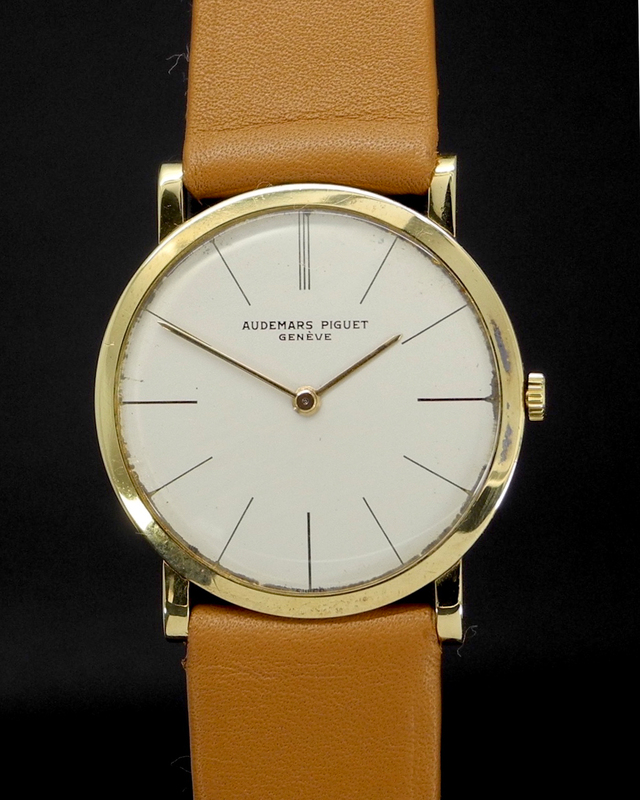 Elegant and understated Audemars Piguet only time reference 7186 cased in yellow gold and powered by a manual caliber. 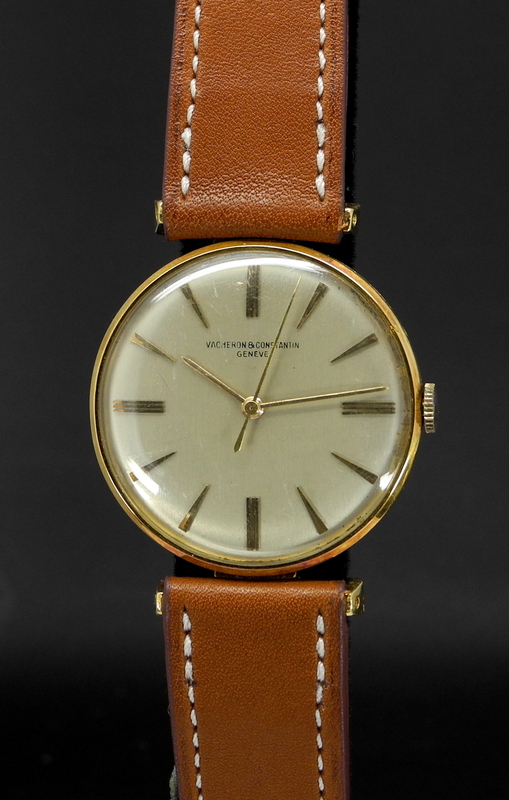 The watch dates to around the 1960's and is fitted on a beautiful brown leather strap. 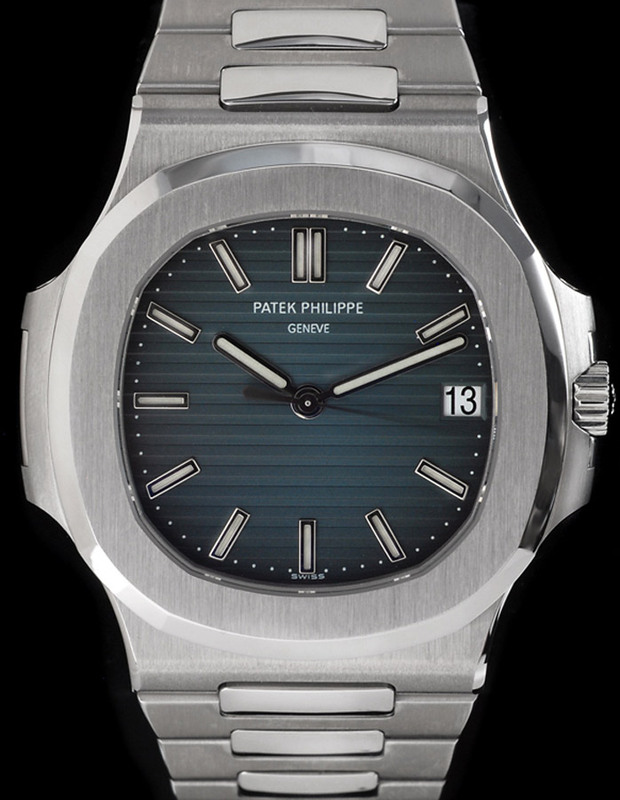 The Patek 2509 is an important watch for the fact that it is a waterproof Calatrava that is powered by a very important movement. 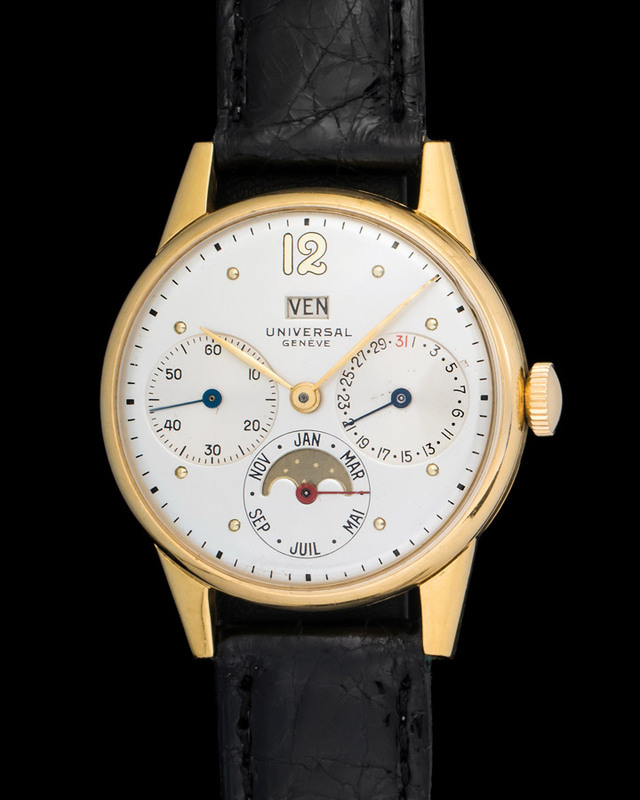 The watch featured here takes that importance a little further by the fact that it is cased in steel and is fitted with a Gubelin signed dial. 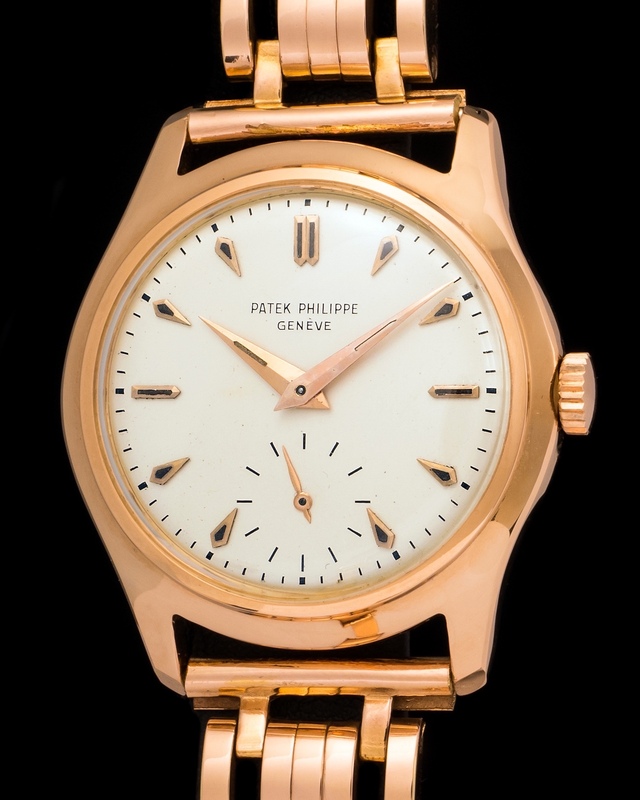 Another noteworthy detail about this 2509 is the fact that it is put together by a steel bracelet and is accompanied by an original Patek Philippe box. 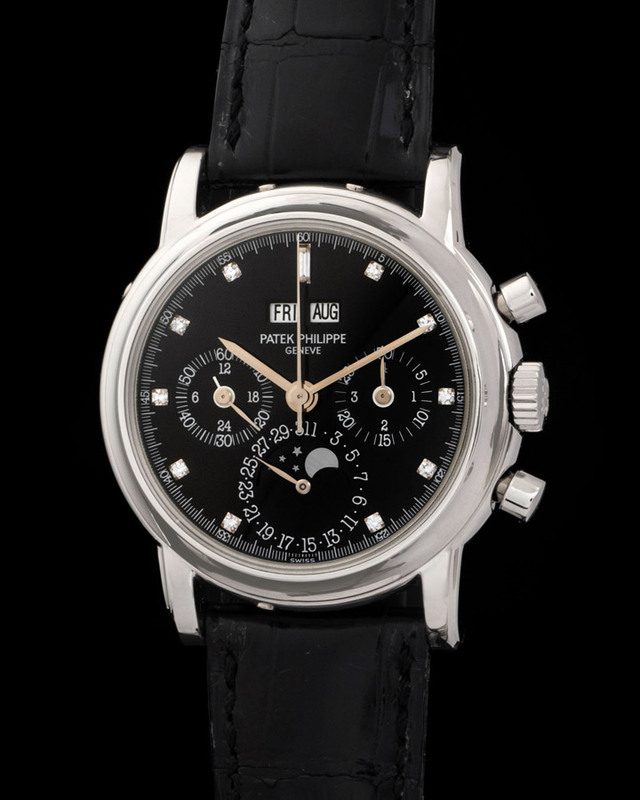 There is no other watch more elegant than a Patek Philippe Perpetual Calendar. These watches are the closest to works of art. 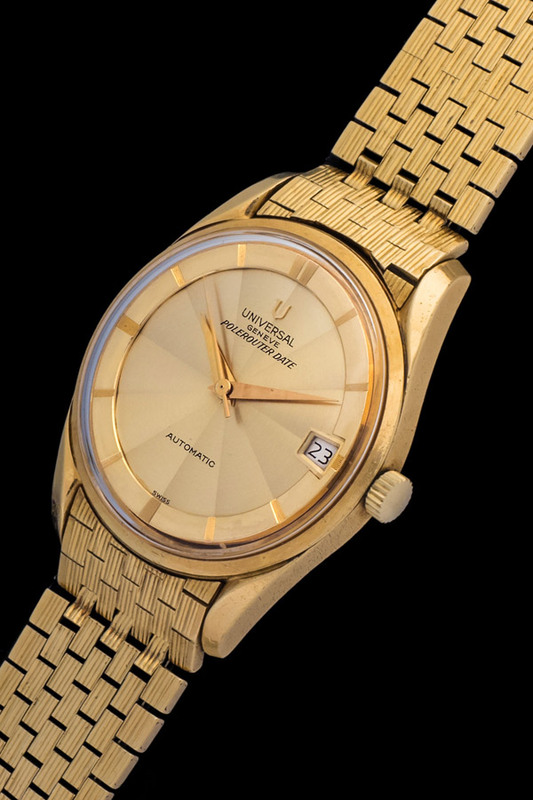 Featured here is a yellow gold ref. 3945 fitted with its original bracelet. The watch is a pleasure to wear and stare. Chances are when you look down at your wrist the time will be the last thing you will be focusing on. Elegant and understated Audemars Piguet only time reference 8914 cased in white gold and powered by a manual caliber. 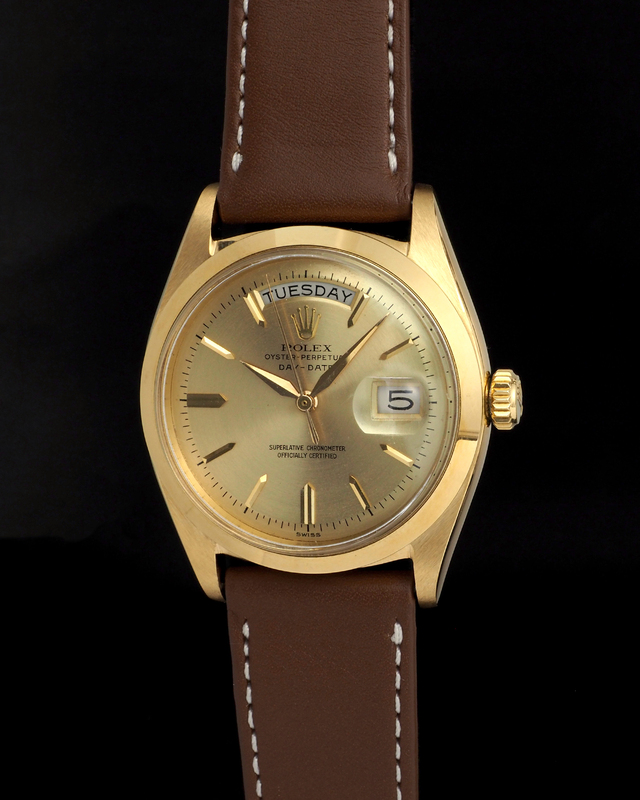 The watch dates to around the 1960's and is fitted on a beautiful Vintage Watches Miami branded leather strap. 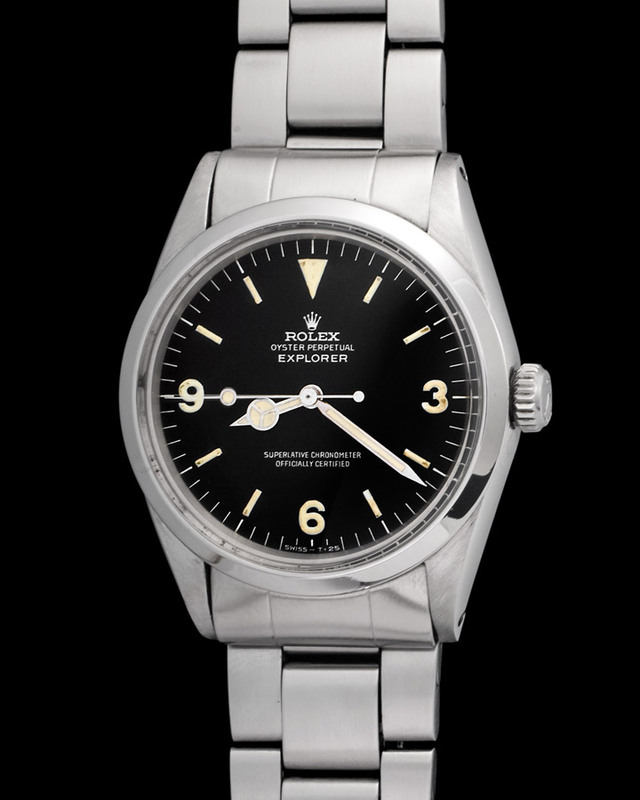 Rolex Precision reference 4357 cased in steel and powered by a manual caliber. 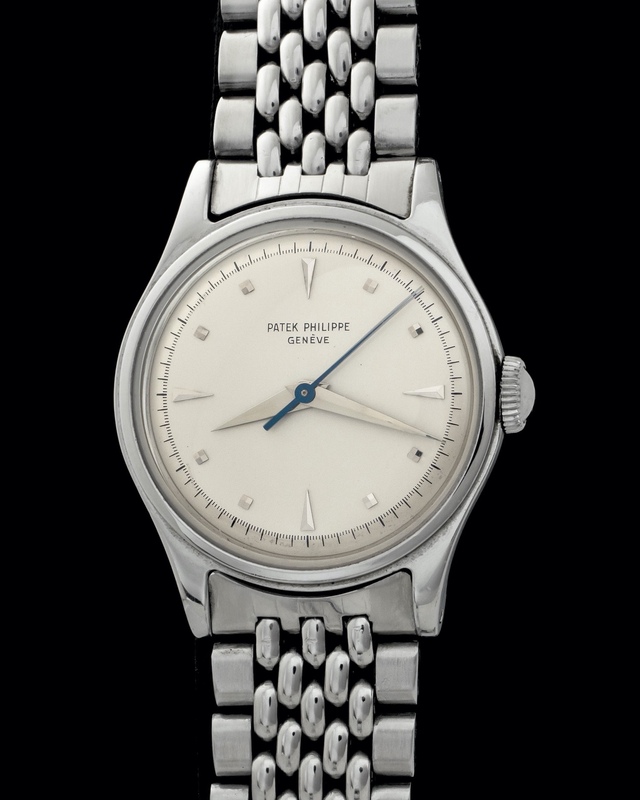 This watch is elegant and distinctive, it offers a hint into what Rolex was thinking in 1954. 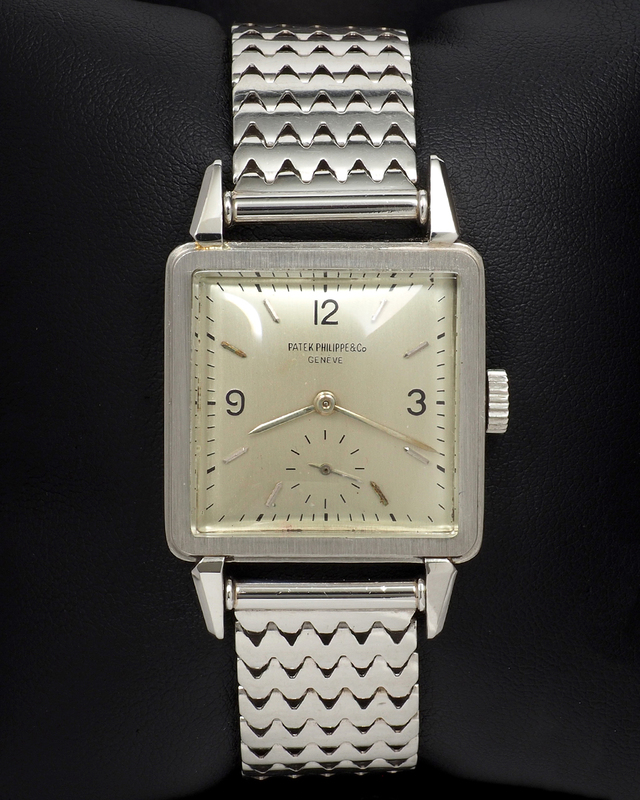 This watch is in good condition, working with no problem. 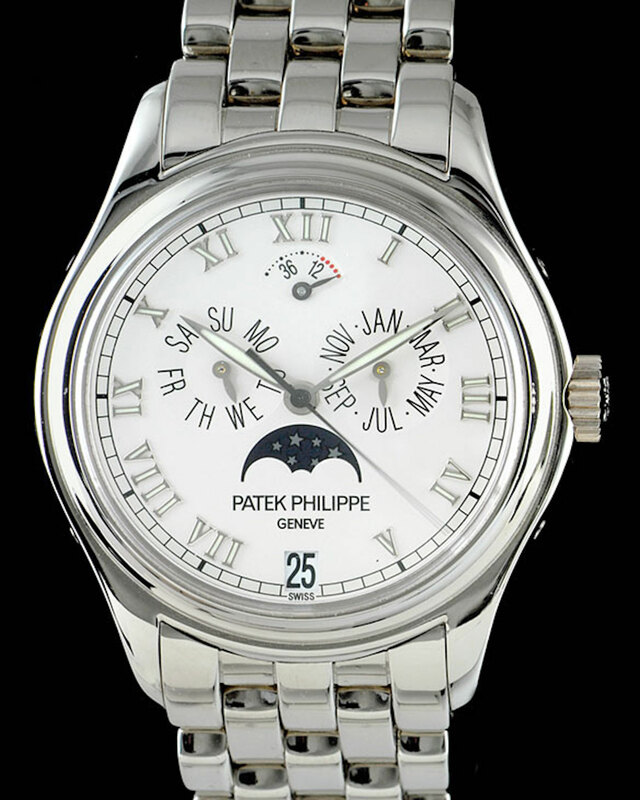 The Patek Philippe Annual Calendar 5036 is one of those watches you could be happy with wearing for the rest of your life. 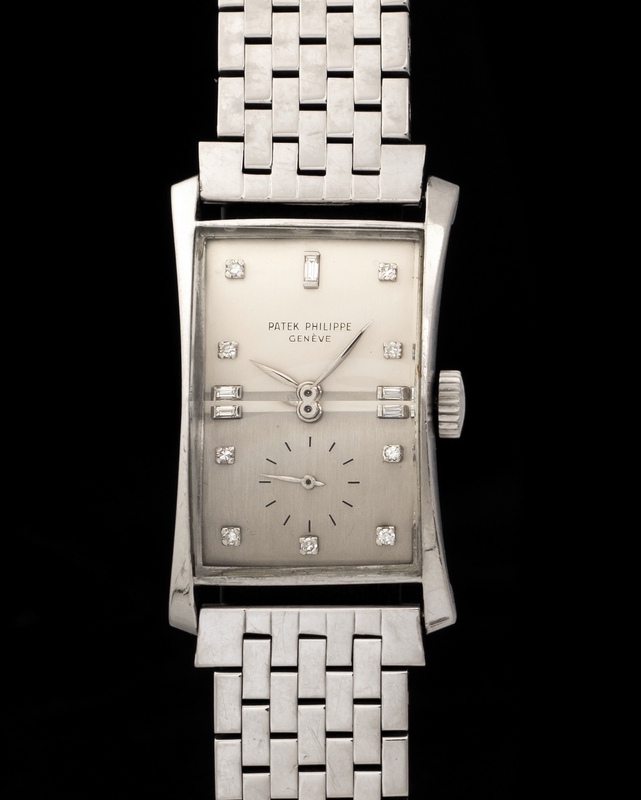 An already discontinued and incredibly well balanced white gold watch put together by an impressively appealing bracelet. Our example was manufactured in 2005 and is accompanied by its original box & papers. 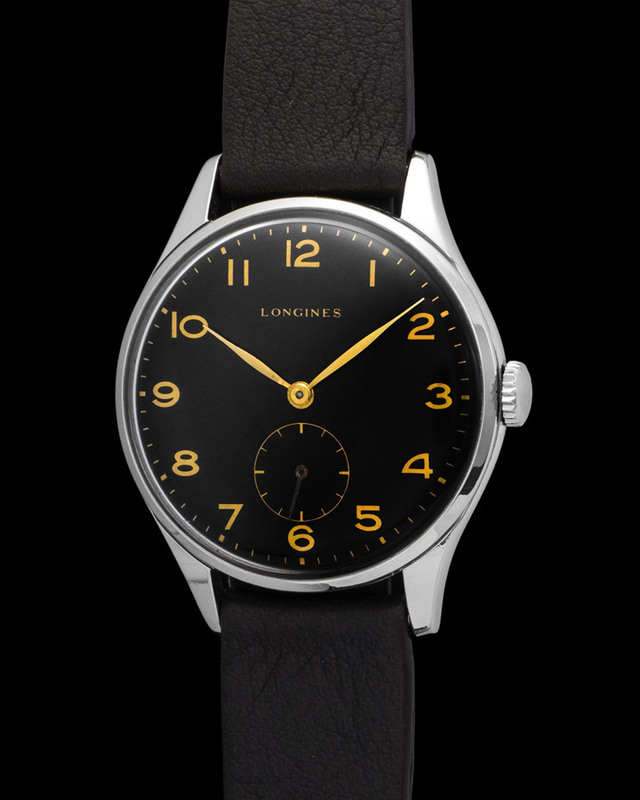 The reference 18206 is arguably one of the most beautiful models in the Day-Date family. 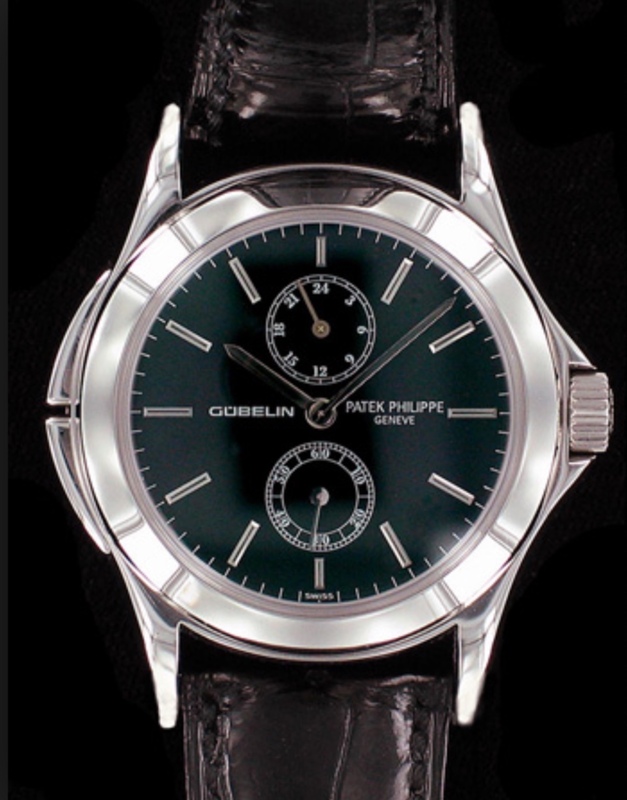 This watch is elegance at its purest. It strays away from the luxurious gold case and array of dial variations with a clean diamond fitted silver dial fitted on a hefty platinum case. A lot can be said about the 18206 but it would not make it proper justice. 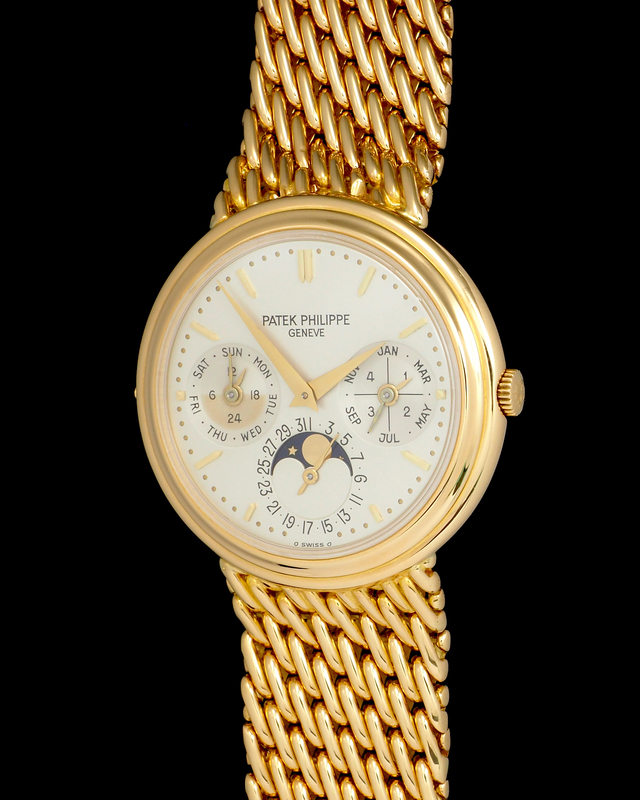 The Patek Philippe 1593 is a watch that is seldom seen as it's estimated that fewer than 1000 were made in its production from 1944 to 1967. 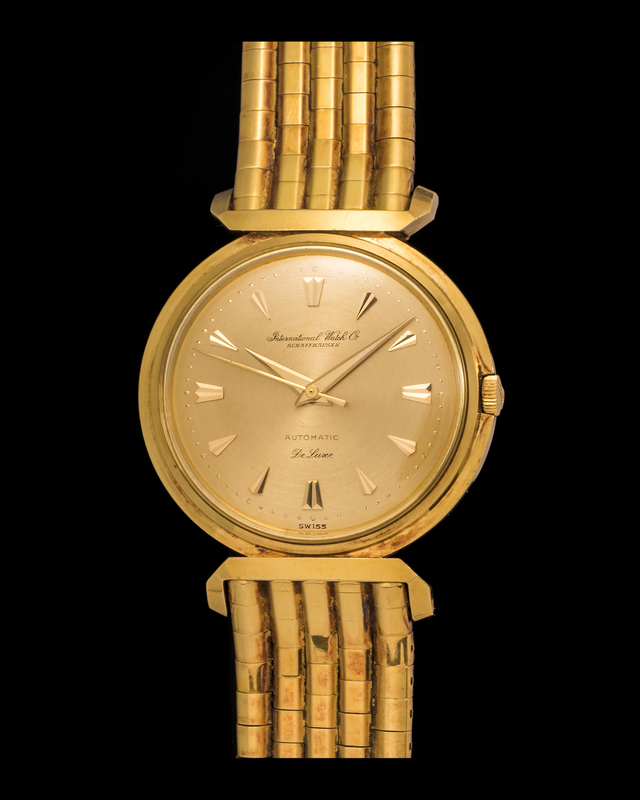 Most of these watches were manufactured in yellow gold but very few were cased in platinum. 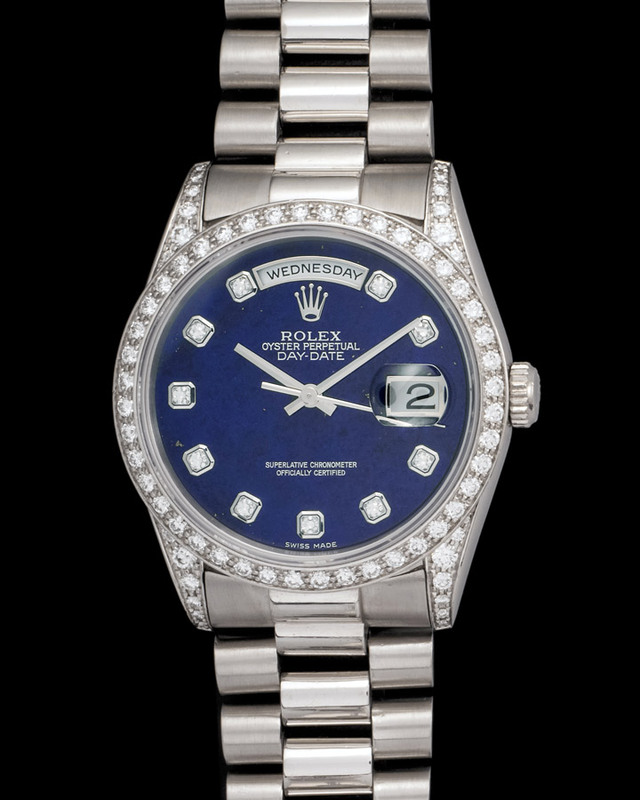 Ours here is platinum, accompanied by a diamond encrusted dial, and put together by a platinum bracelet. 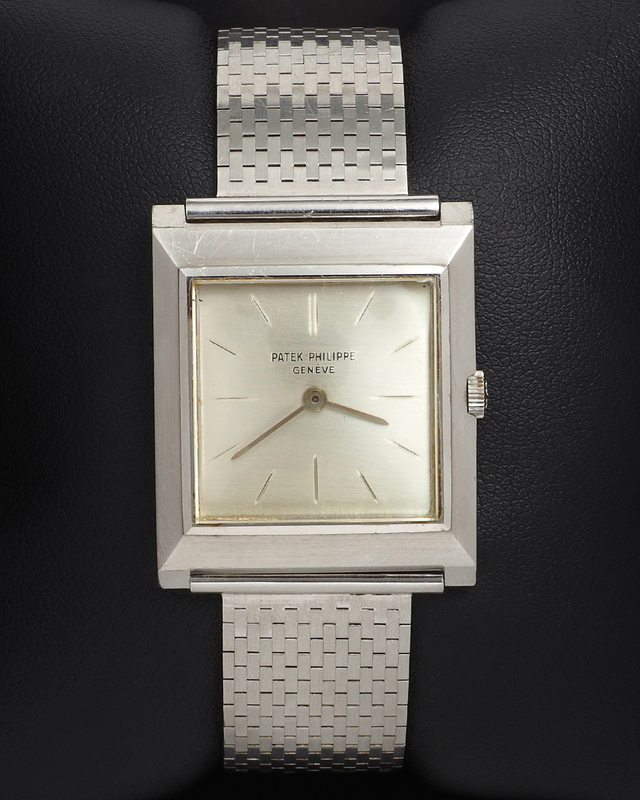 The watch was manufactured in 1953 and its condition is stellar. Incredible oversized rectangular cased Vacheron from 1930. 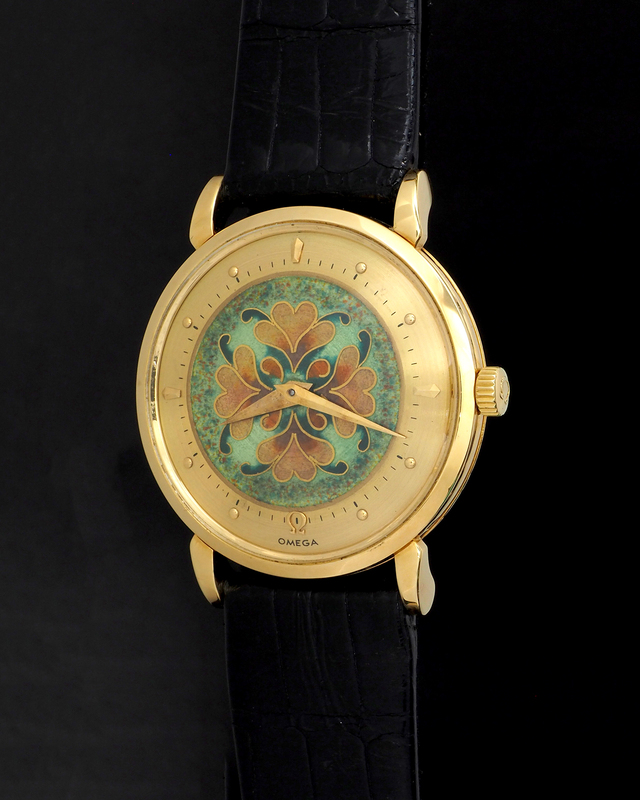 The fact that the manufacture was producing these watches during that time period is amazing. The present watch is in top condition and is powered by a manual caliber and put together by a leather strap. 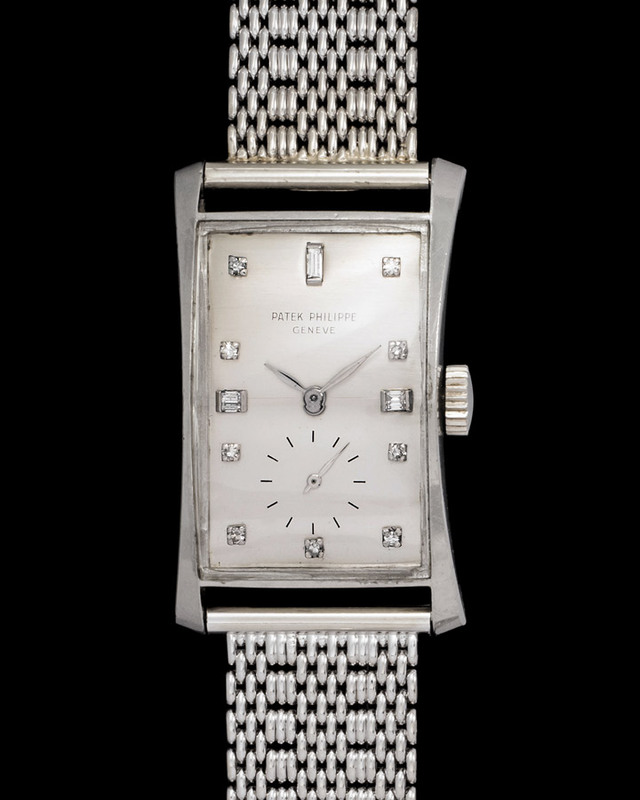 The reference 2509 is perhaps one of Patek's most beautiful vintage Calatrava's. It is powered by an important movement and is cased in a waterproof case. However there are certain 2509's that are stand outs. This one here is one of them. 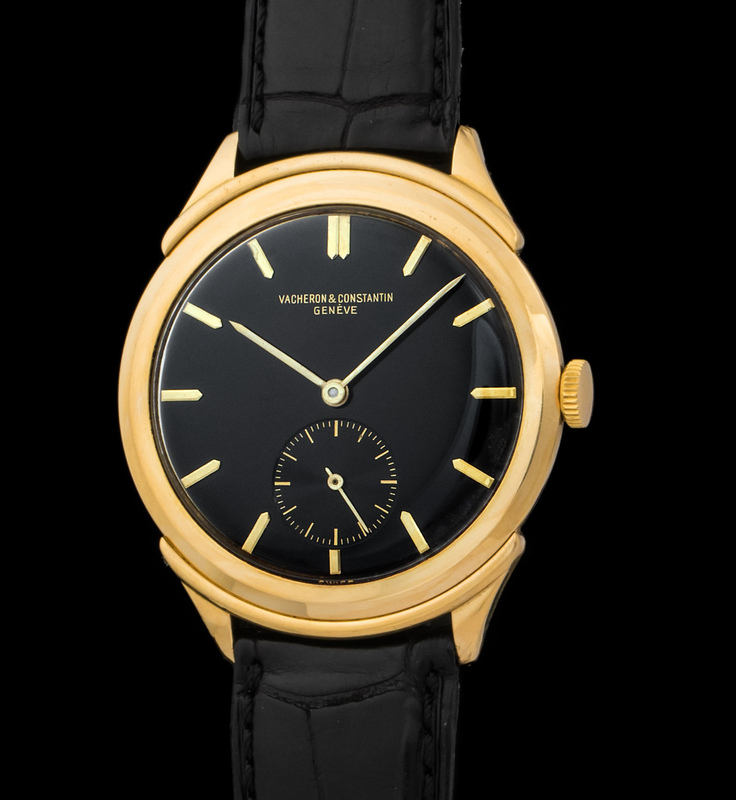 First because it is cased in pink gold and second because it features a tritium dial accompanied by tritium hands. 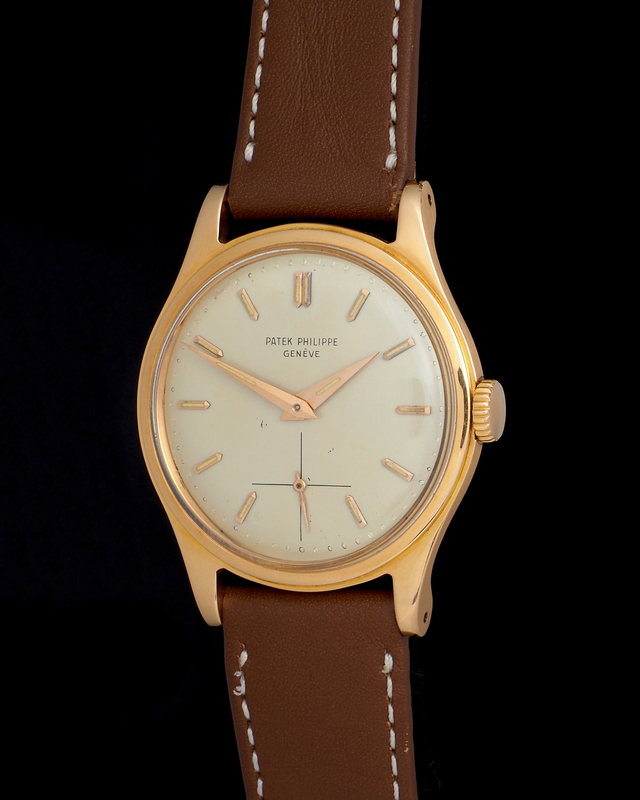 Furthermore this 2509 is accompanied by an original Patek Philippe box and Extract of Archives document. This charismatic Vacheron Constantin is cased in an 18K yellow gold tonneau case and featuring a big Arabic numeral dial. Powered by a manual caliber and put together by a leather strap. 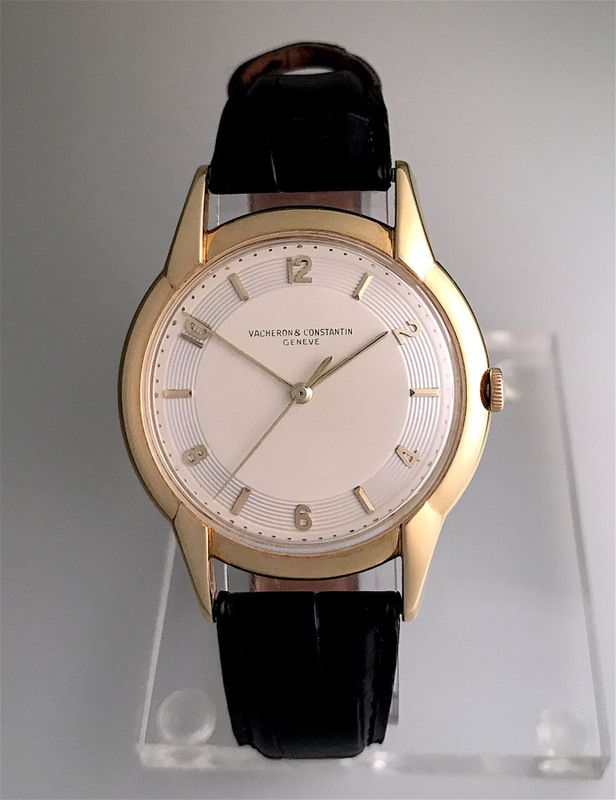 The production period of this Vacheron nears the 1930's era. 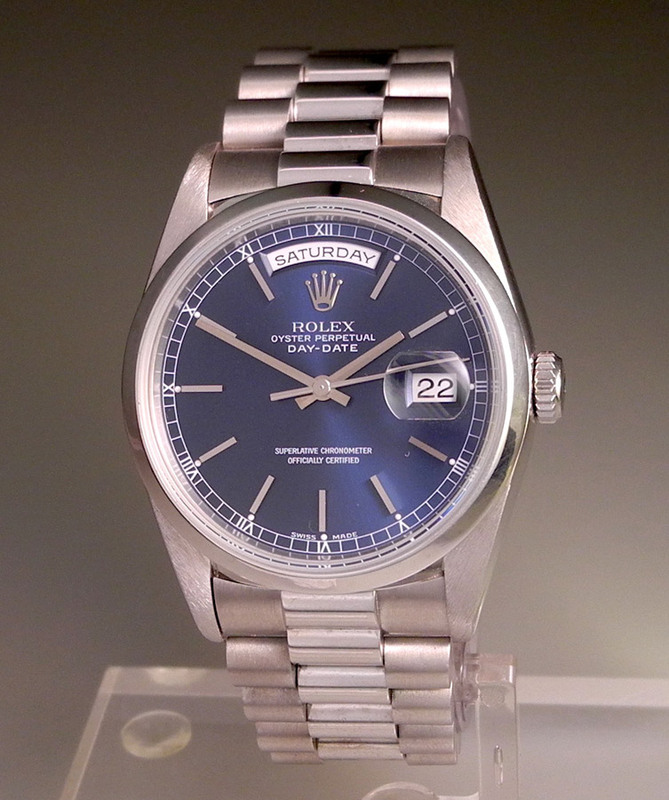 The Rolex Datejust is the embodiment of elegance and utility. Our 6605 was manufactured in 1958 and still holds its own. 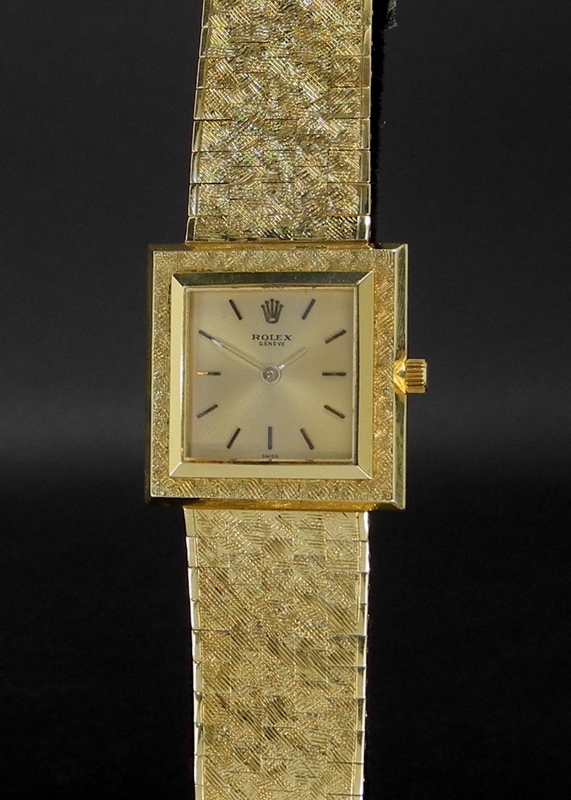 Cased in a 36mm yellow gold case and put together by a jubilee bracelet. 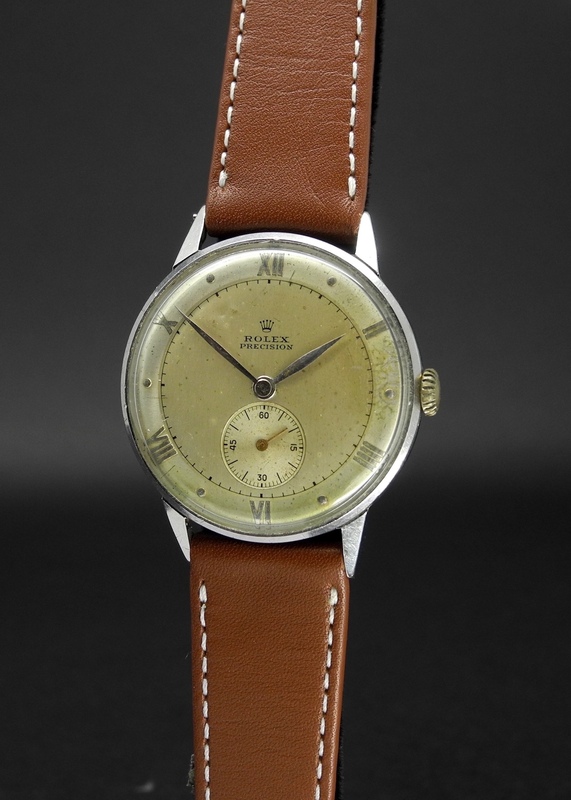 The automatic movement works perfectly, while its patina heavy dial is a pleasure to look at. 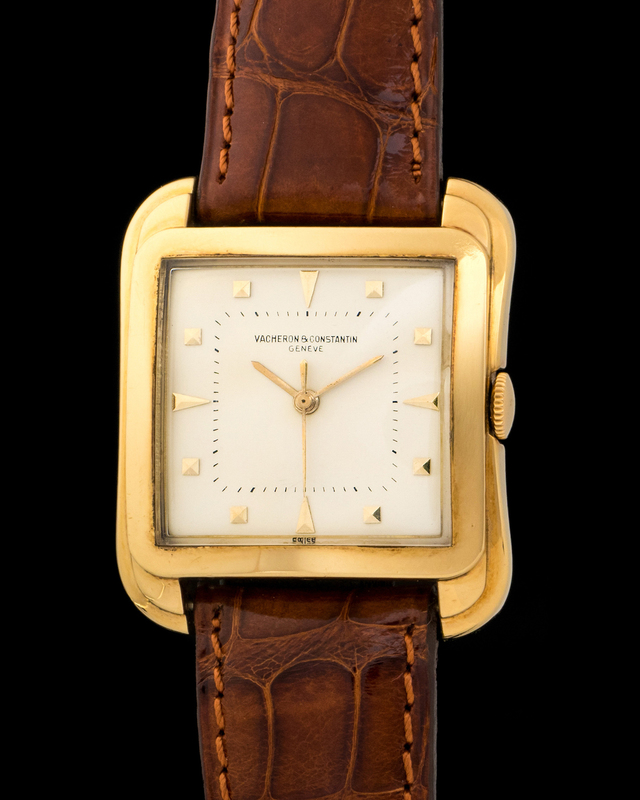 Featured is a Vacheron Constantin 4822 from 1950 in an 18k yellow gold square-shaped case, deemed the "cioccolatone" by Italian collectors. Powered by a cal. P454/5B mechanical movement. 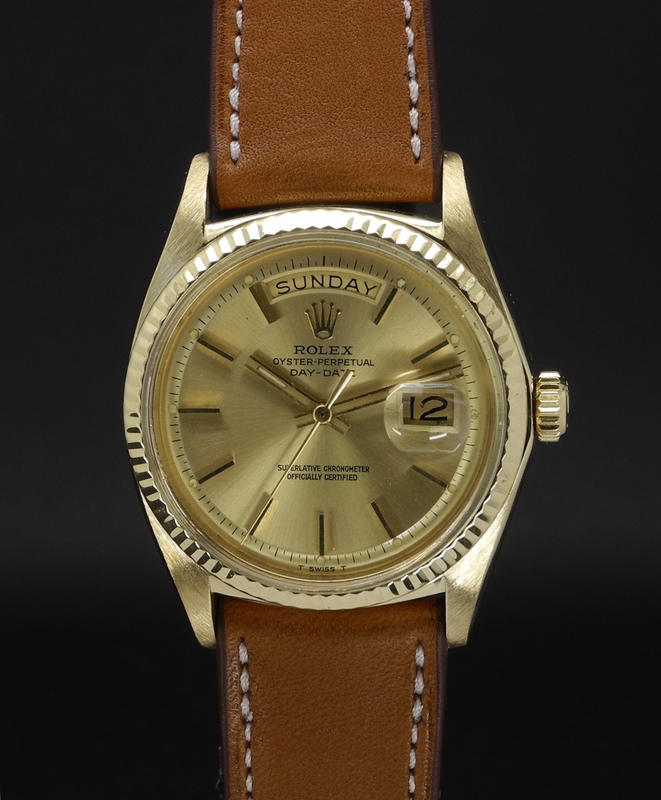 The rarest aspect about this watch is the fact that it's a manual ref. 4822, most of these come along with automatic movements. 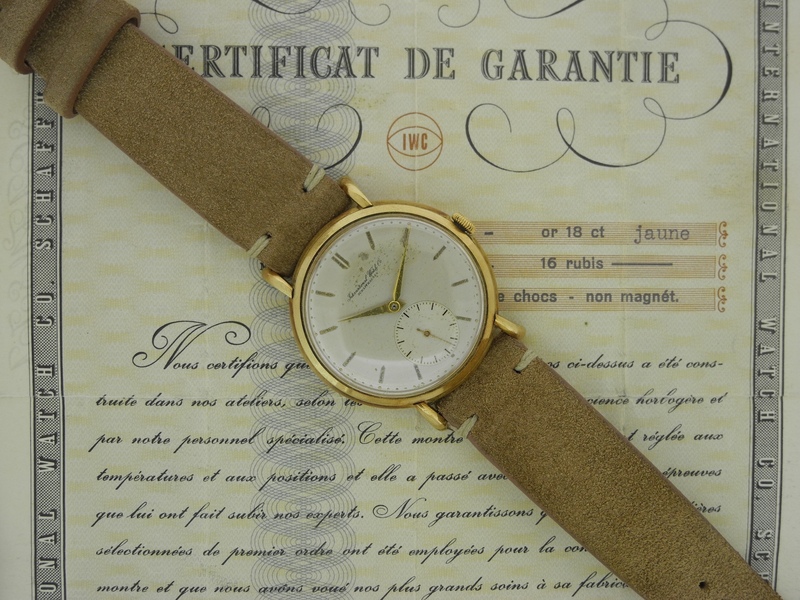 IWC De Luxe Automatic cased in solid yellow gold and put together by an original IWC brick bracelet. The dial is printed with the long signature of IWC, which is an increasingly sought after detail. This watch is powered by a caliber 852 automatic. 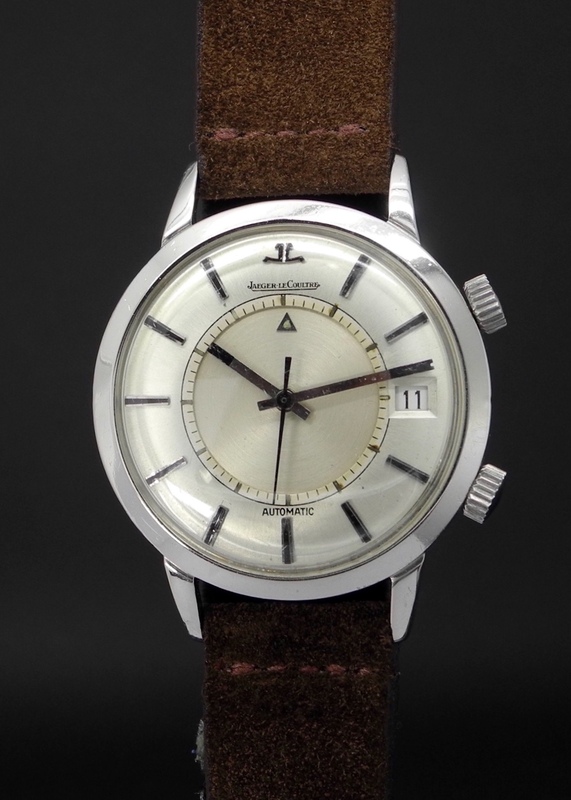 The Jaeger LeCoultre Mystery is a fun watch, not many are seen around. The watch is powered by a manual caliber and the case finishing is very elegant and distinctive. Cased in 18K yellow gold with a detachable bracelet. Two details make this watch interesting and fun to wear. 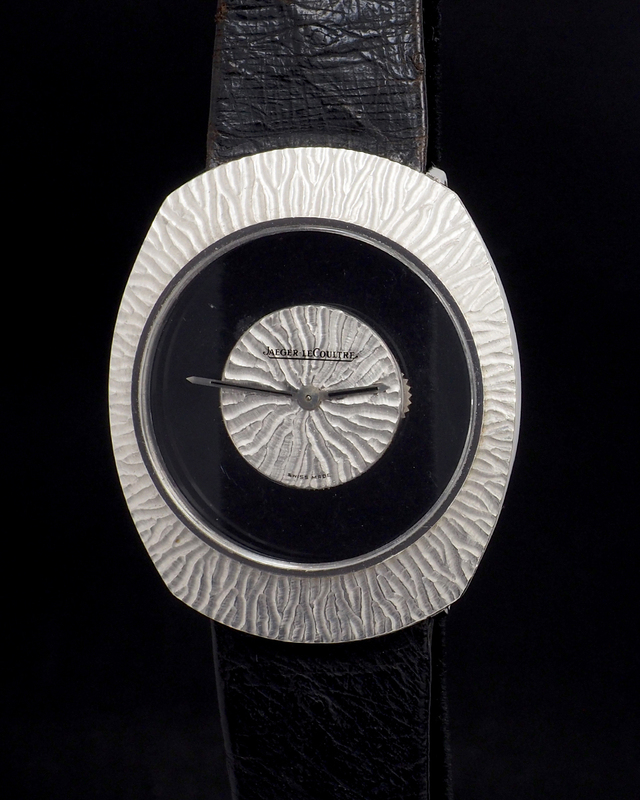 Its mystery dial and white gold bark finishing. 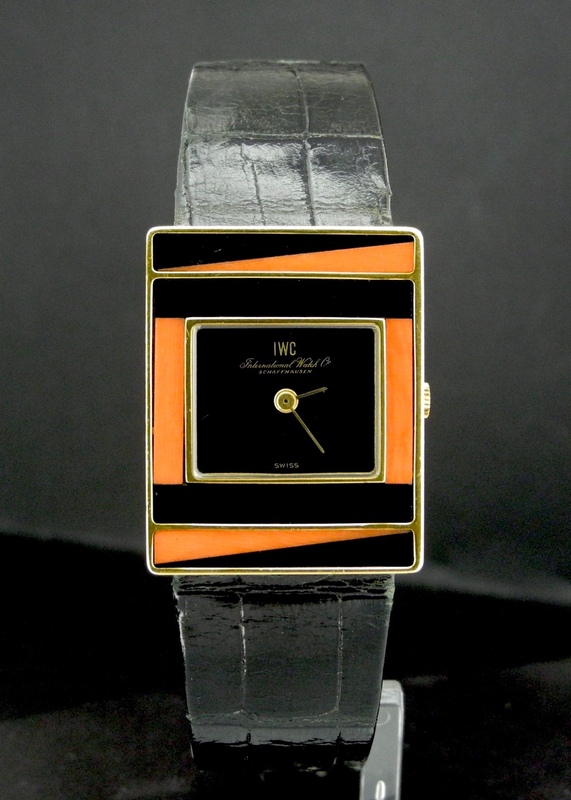 Jaeger LeCoultre made some very interesting watches during the 1970's and this one is one of them. The condition of the watch is great with its manual caliber working without issue. 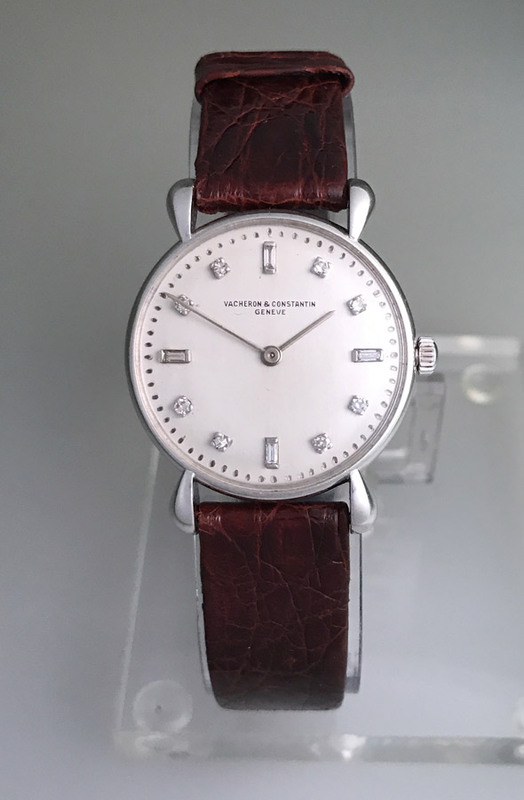 Jaeger LeCoultre Mystery cased in solid white gold and found in top condition. The manual caliber works without flaw while its case is crisp and looks like new. The cool factor about the Mystery is the fact that its a watch that can be worn by men or women. 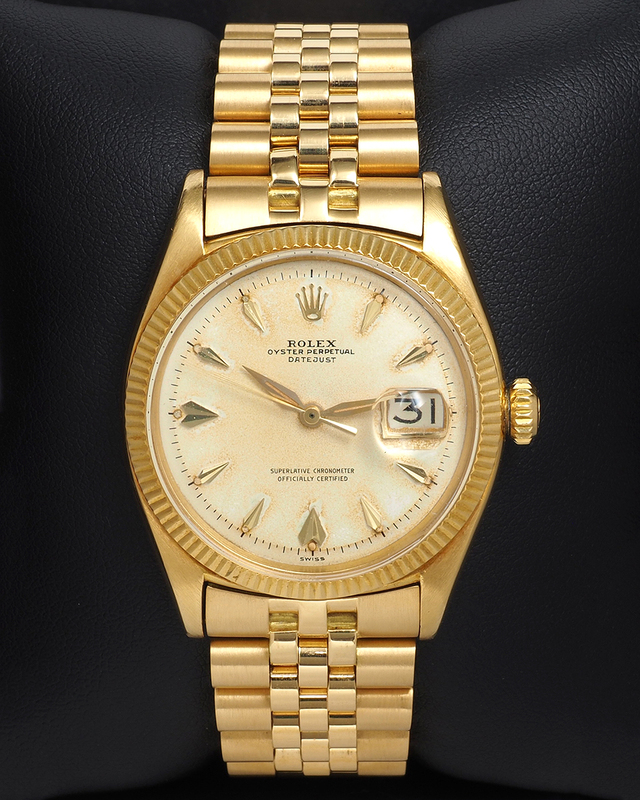 Elegant and versatile Rolex Date cased in a 14K yellow gold case and powered by an automatic caliber. 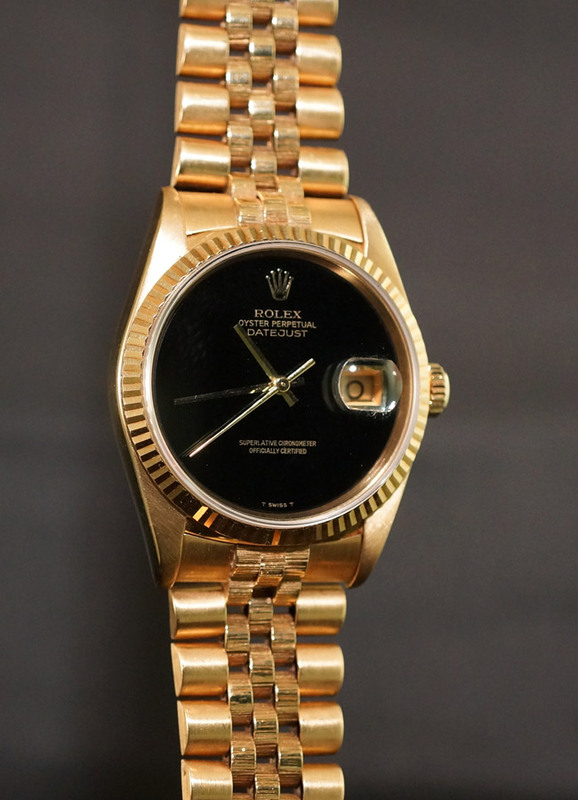 The overall look and feel of this watch is really cool as its combination of an all gold case and gold colored dial make for a stunning Rolex. 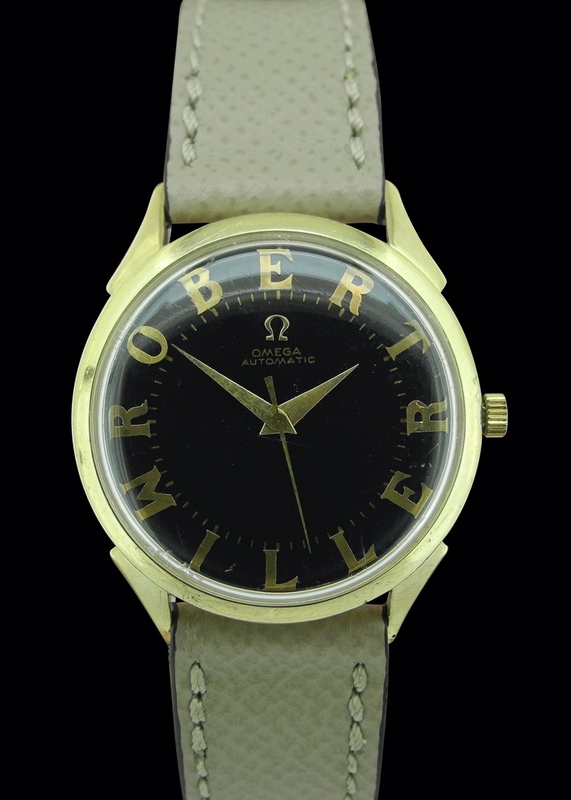 Omega only time watch with center seconds hand and personalized possibly unique dial bearing the words "Robert Miller". 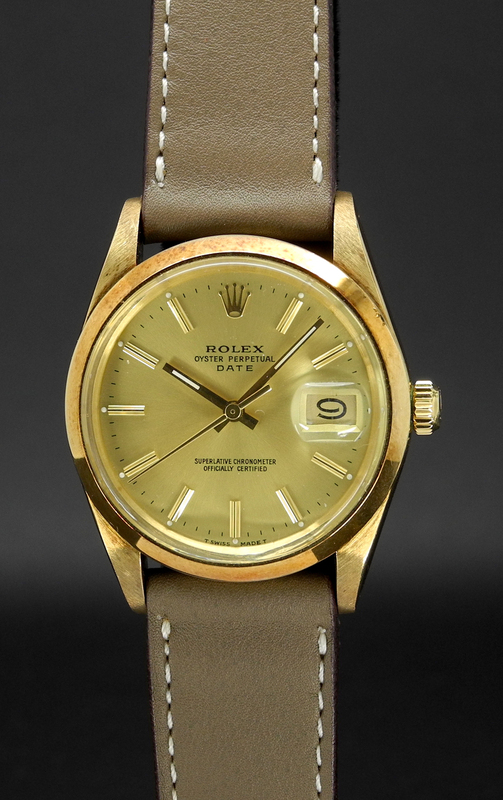 The watch is cased in 18K yellow gold and powered by a bumper movement. The stretch bracelet is not Omega signed but made from yellow gold. 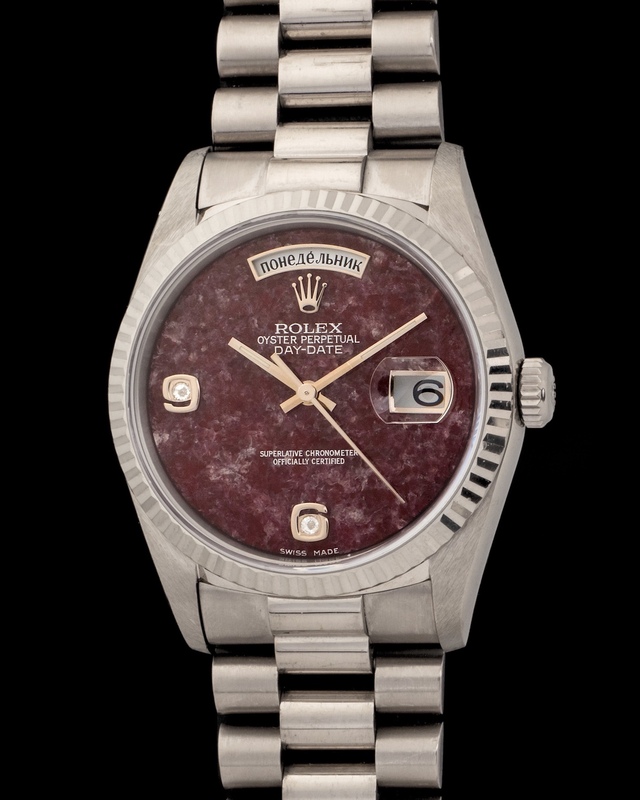 Datejust’s are the classiest most straight to the point models Rolex has ever manufactured. They tell time and indicate the date that is it. As simple as they are they are also magnificent and filled with history. 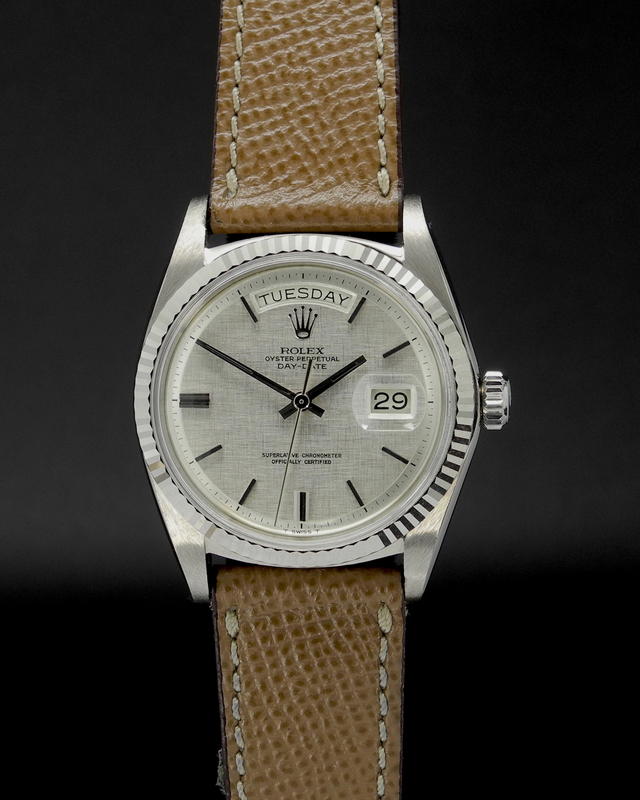 Take this Datejust for example. 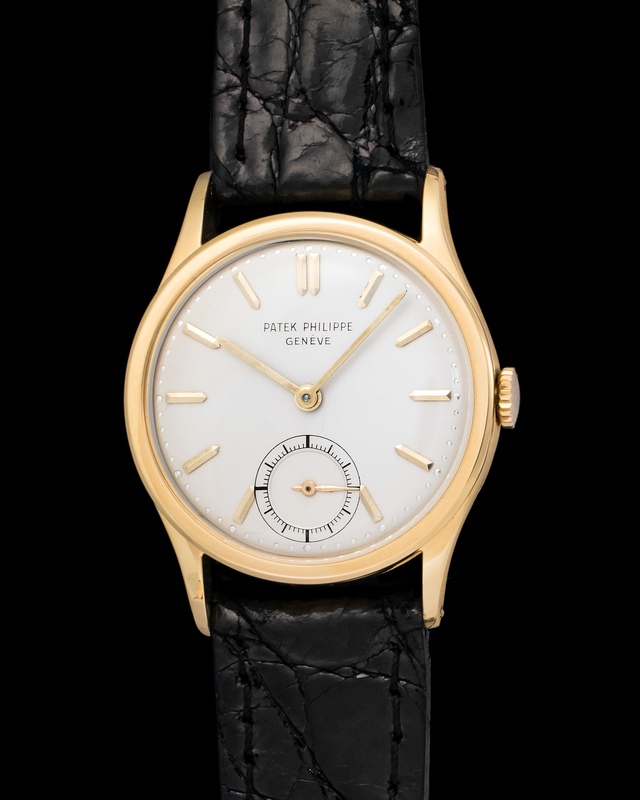 It comes with an outstanding white lacquered dial, which is just a joy to look at. 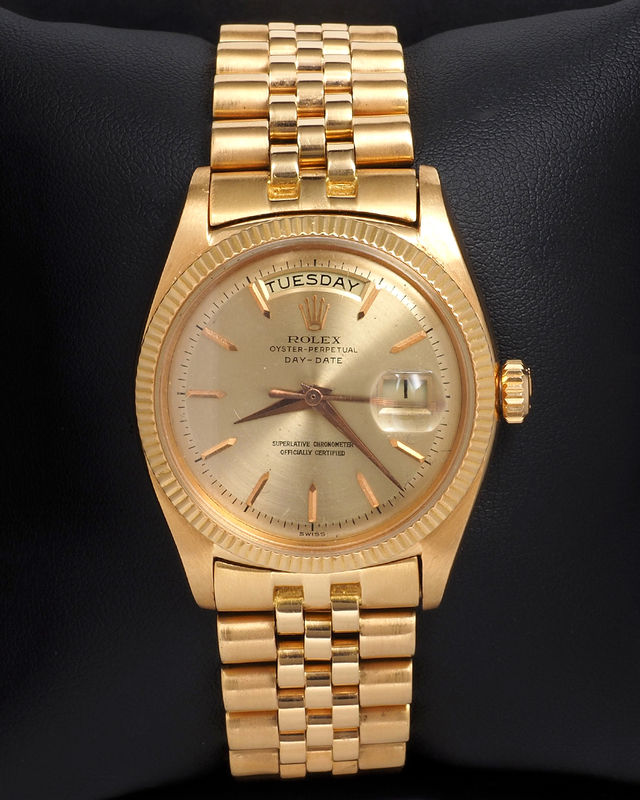 The watch was manufactured in 1986 and is cased in a flawless ultra mint 18K yellow gold case. Powered by an automatic caliber 3035 fitted with 27 jewels. 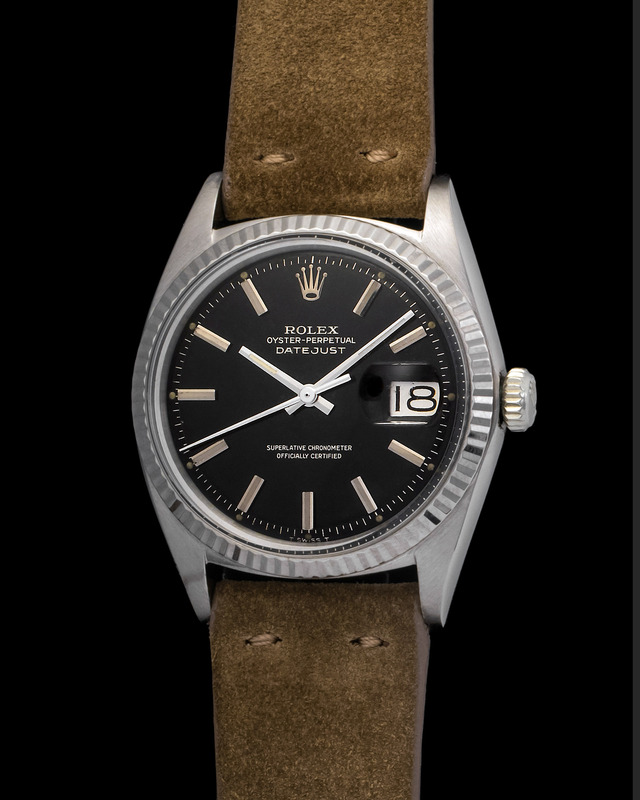 The brown leather strap is new and comes attached with a Rolex signed buckle. 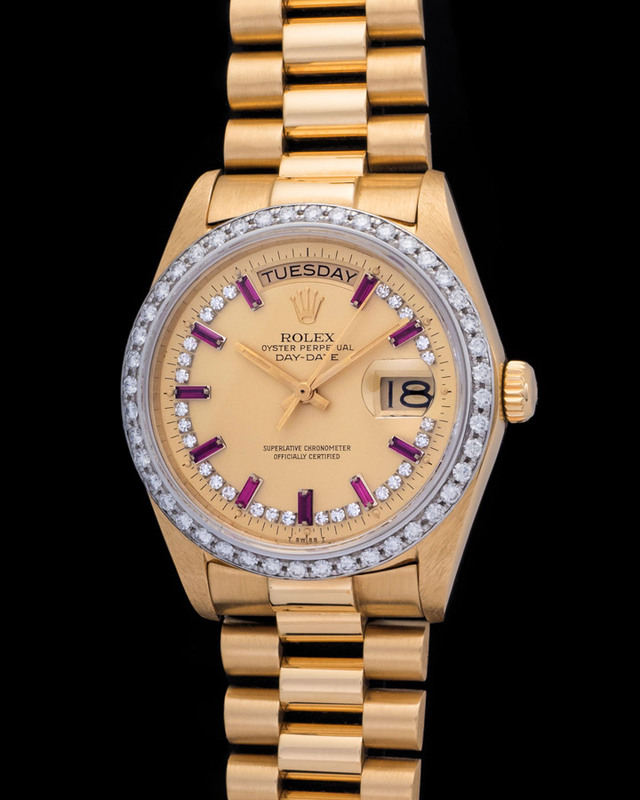 The Day Date is Rolex’s interpretation of timeless elegance. These watches have accompanied presidents and captains of industry and probably will continue to do so for generations to come. 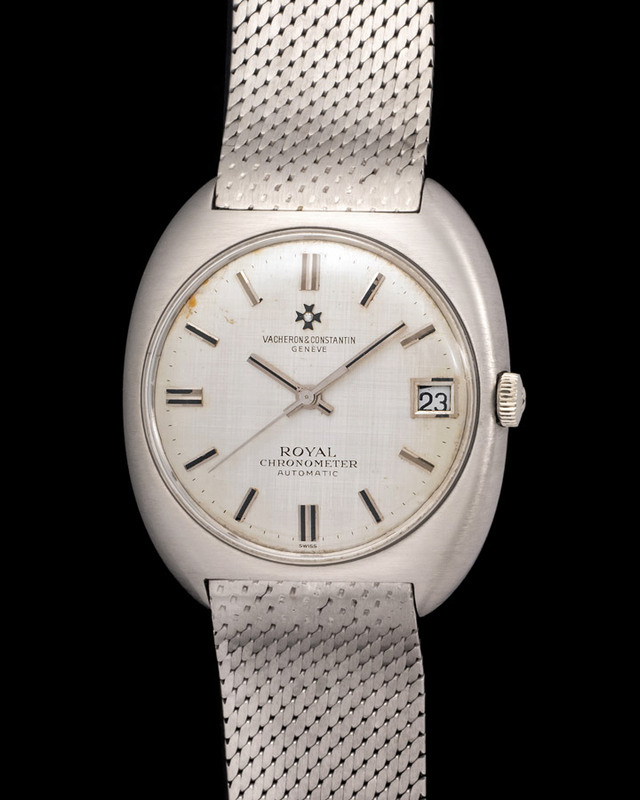 Here we have a rare 6612B as it was released in 1959 bearing a first generation dial. 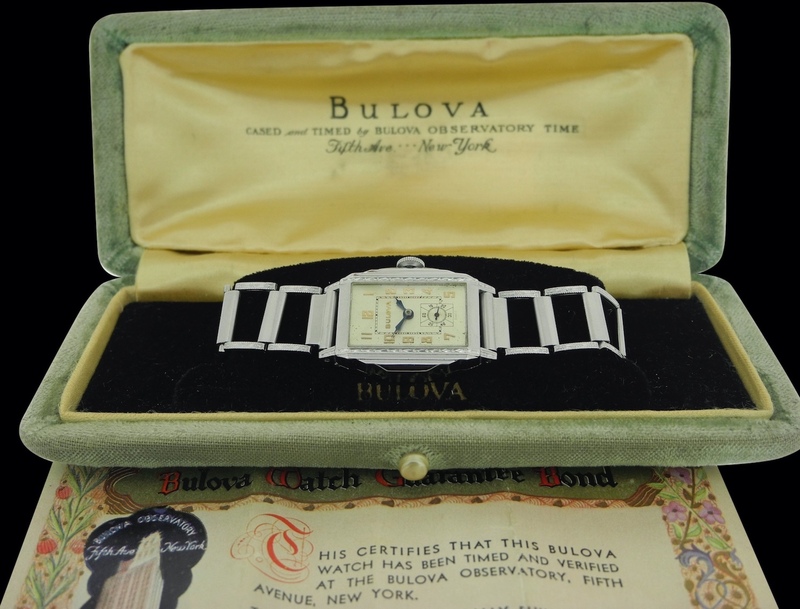 Fantastic looking Bulova accompanied by a full set of box and papers. 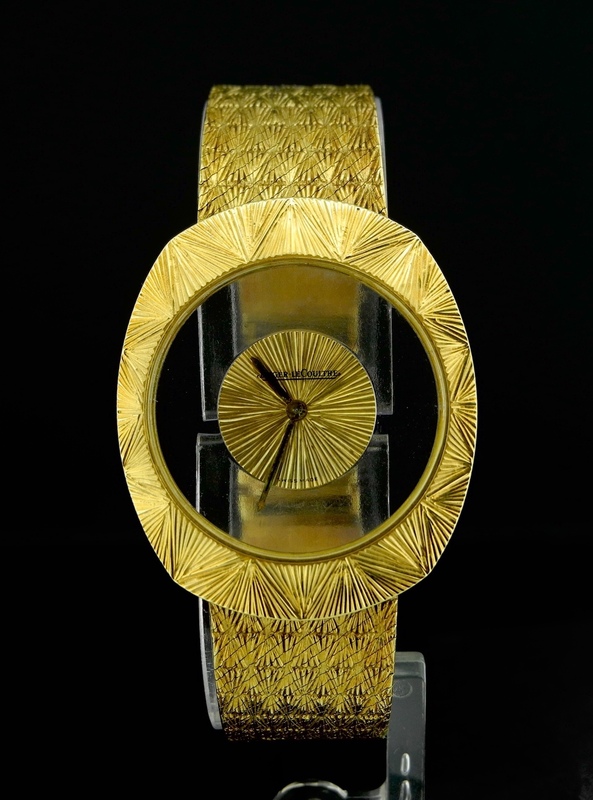 This watch looks very much from the time when art deco was influencing the world over. Cased in a 30mm steel case and powered by a manual movement. A specially cool detail about this watch is the box and how well built and sturdy it feels. 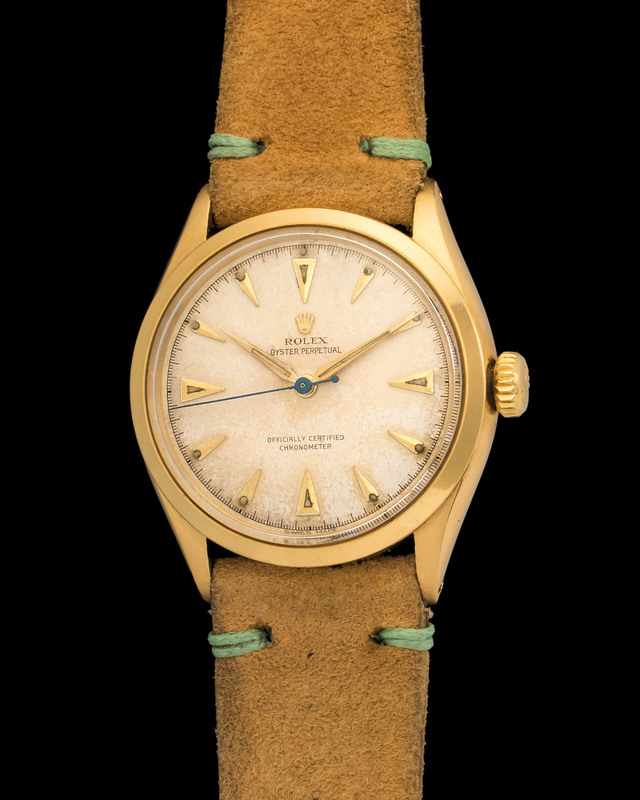 Rolex Oyster 6284 manufactured in 1954 in absolute beautiful conditions. 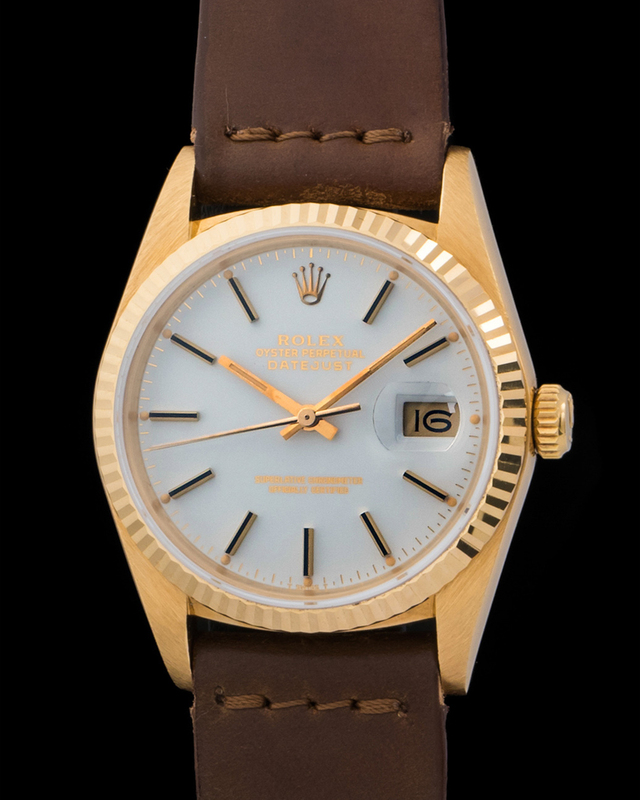 Finding these kinds of watches is always thrilling to us as they represent time capsules to a time when Rolex was an up and coming manufacturer. If you are looking for cufflinks that will stand out, we have you covered. 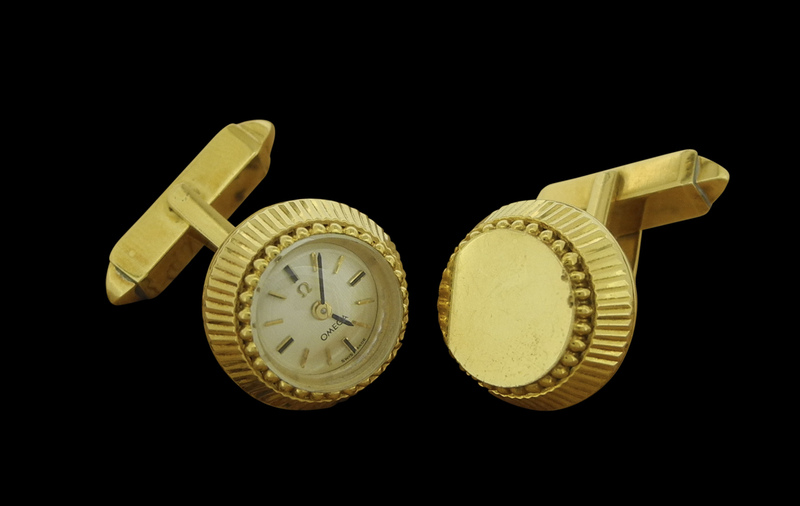 These Omega cufflinks are elegant and seldom seen. 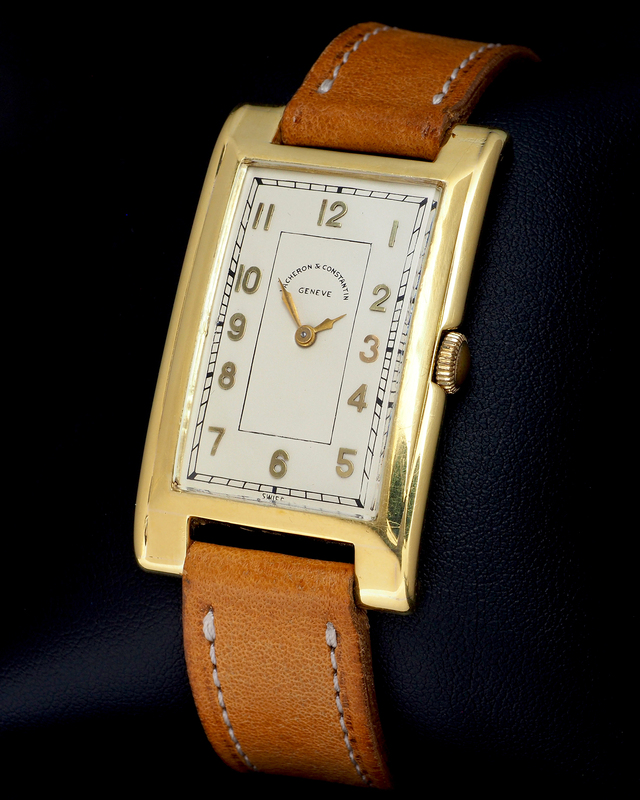 Cased in yellow gold and with one displaying the time. 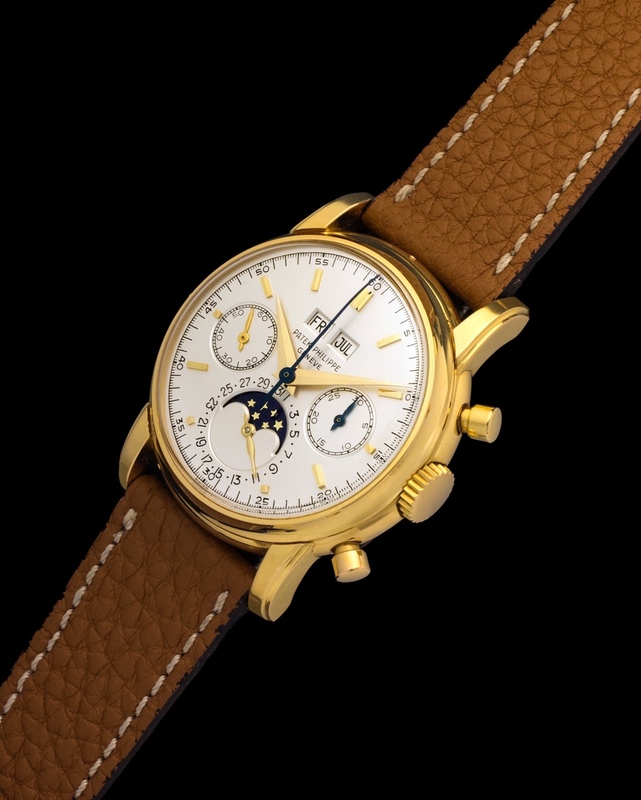 IWC only time watch powered by a manual movement and cased in yellow gold with enamel and coral accents. 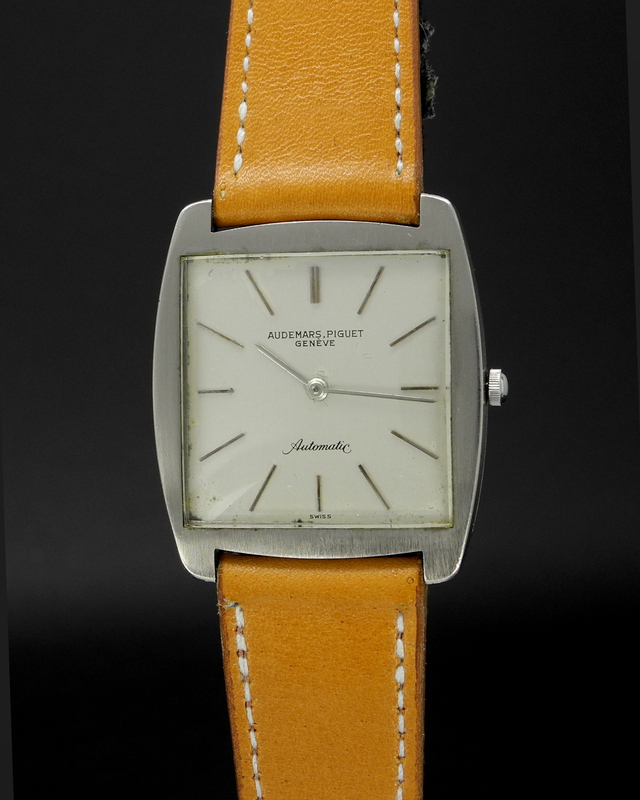 The watch was manufactured in the 1970's and is in top condition with signs of very minimal wear. Elegant and interesting looking Vacheron Constantin cased in a yellow gold case fitted with the always cool 'Van Cleef" lugs. 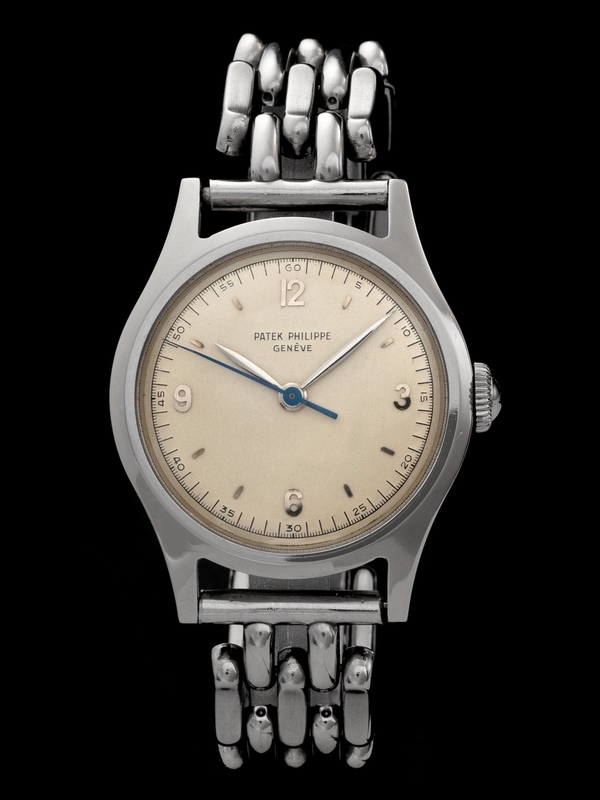 This watch hails from 1958 and is powered by a manual movement that keeps perfect time. Elegant IWC Only Time accompanied by its original paper. 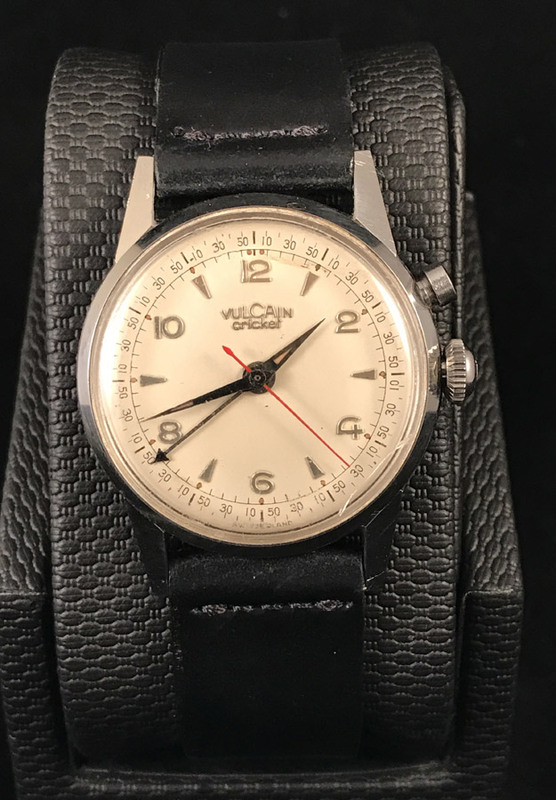 The condition of the case is good, while the dial shows some signs of minor spotting. The manual movement works without problem. 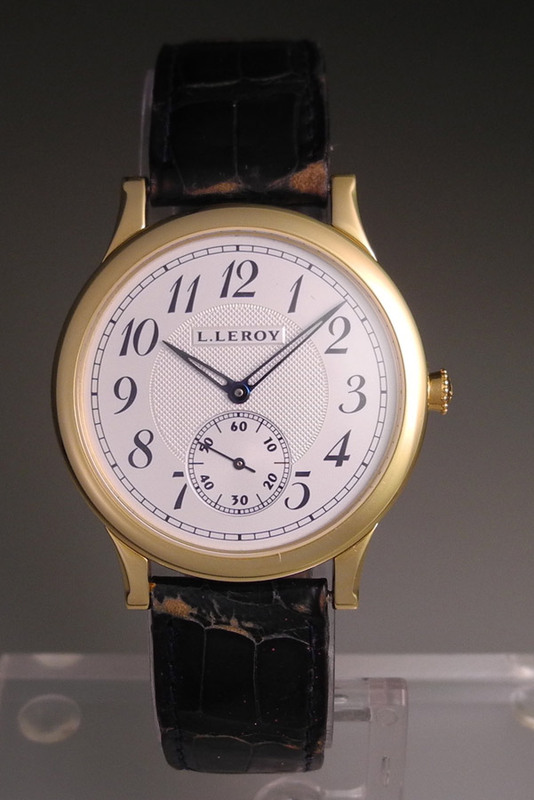 Elegant Cuervo y Sobrinos Esplendidos in yellow gold fitted on a brown leather strap. Manufactured in 1999 and powered by a manual caliber. Accompanied by its original papers. 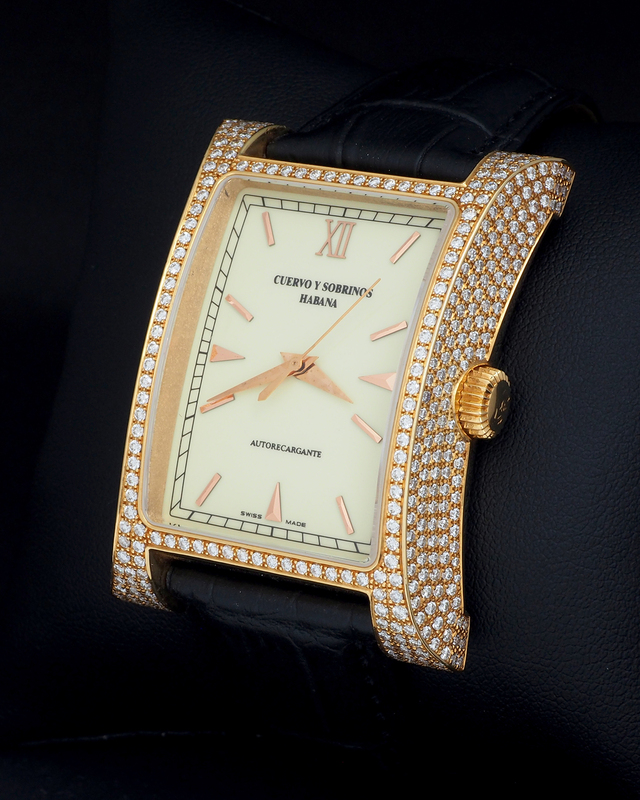 Cuervo y Sobrinos Esplendidos automatic watch cased in pink gold fitted with full pave diamonds and a flawless cream dial. 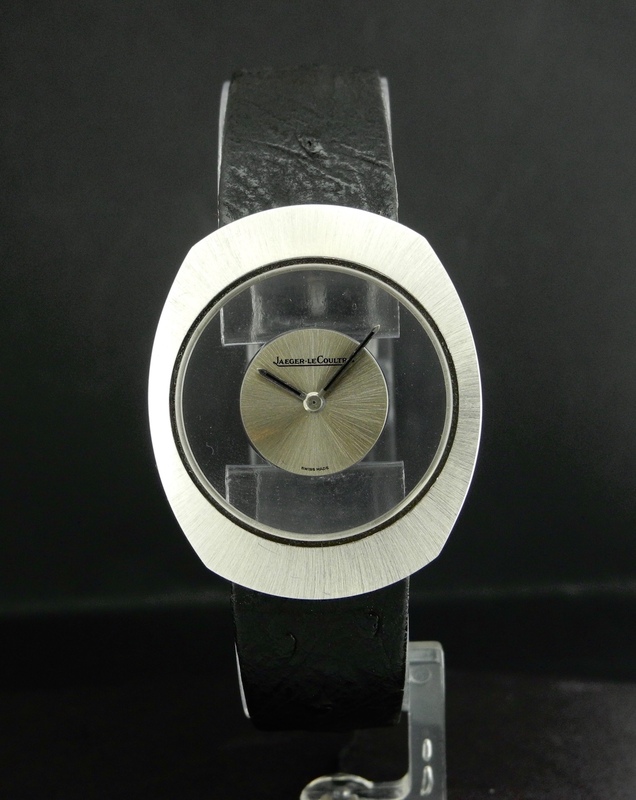 This watch comes with its original black strap and signed clasp.